The carpals are seven little bones which connect the metacarpals, pteroid and radio-ulna pair together. 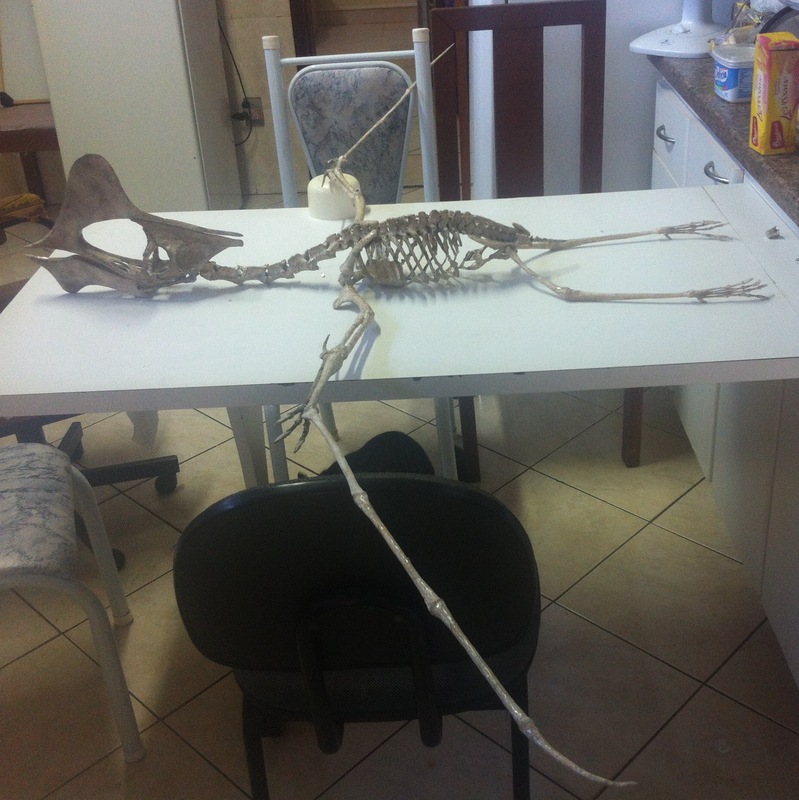 I had no sources for Tupuxuara, and after spending a day trying to make a pair of syncarpals (fused carpals) from Tapejara, I decided to use Anhanguera as a source. 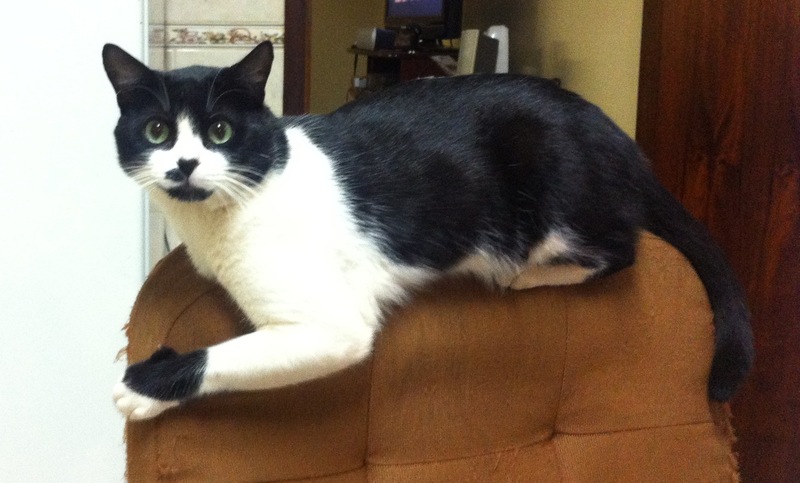 So my Tupuxuara’s wrist actually belongs to Anhanguera. There are five distal carpals, and four of them are fused together so they actually act as two: the distal syncarpal, which articulates the hand metacarpals, and the pre-axial carpal which articulates the pteroid. 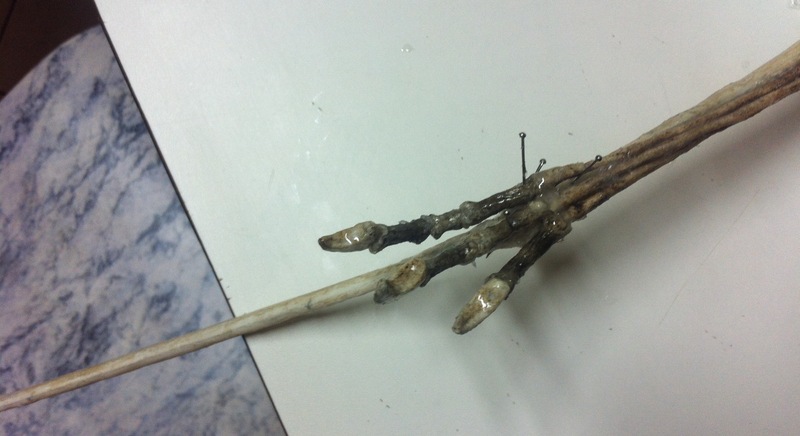 There are two proximal carpals, also fused, which connect to the radio-ulna pair. 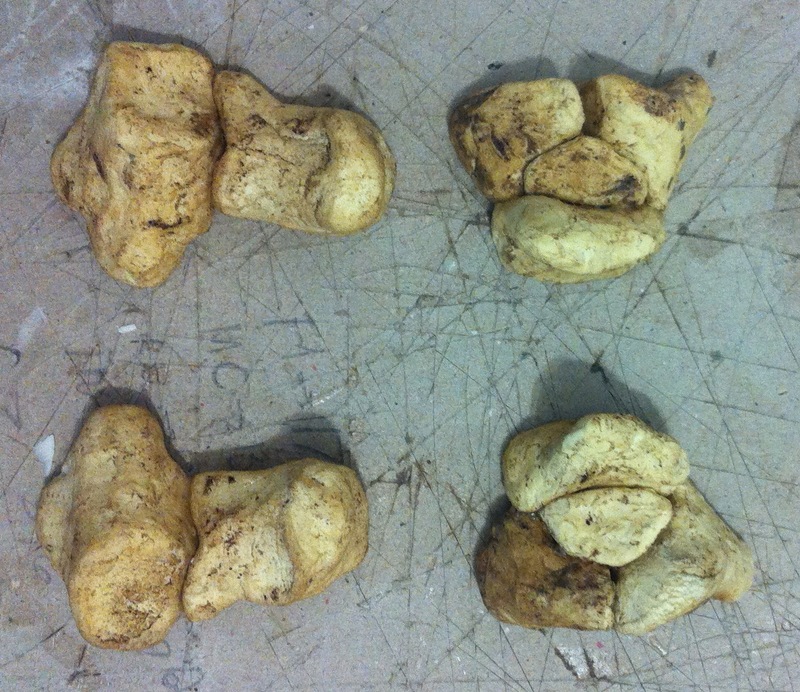 I used Anhanguera (Kellner and Tomida 2000) which provides four views of the proximal and distal syncarpals. 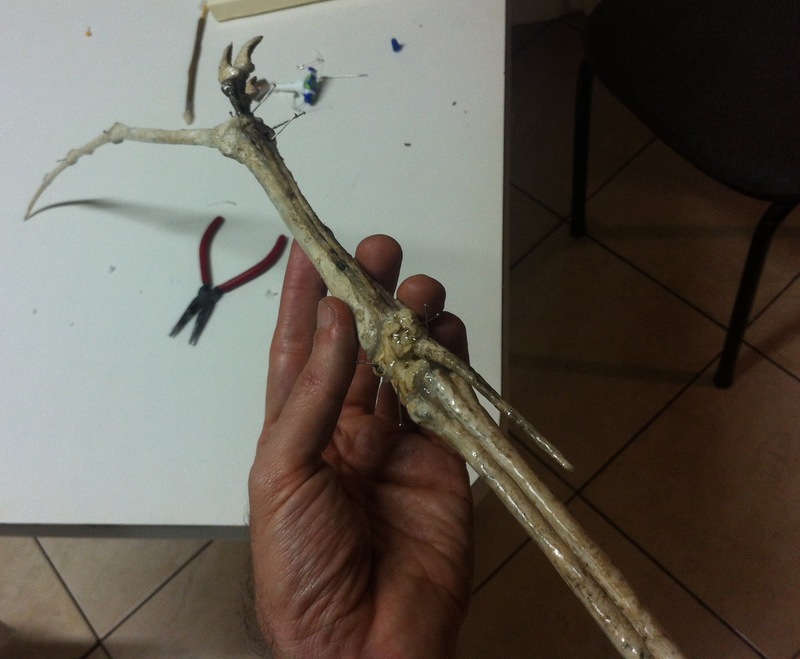 I made up the medial carpal (roughly based on other pterosaurs and drawings). 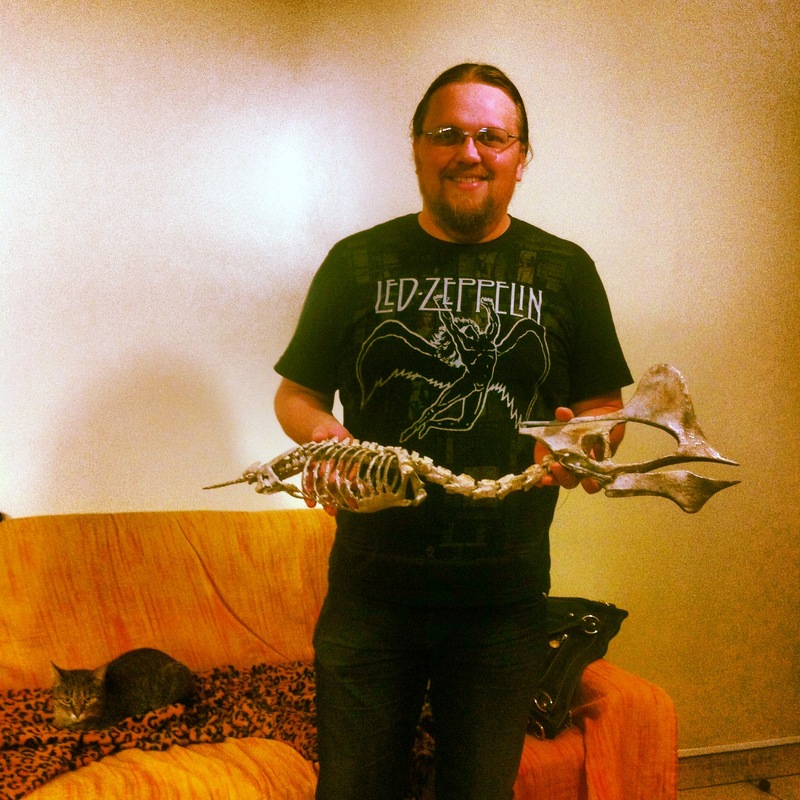 I adapted the pteroid from Pteranodon and adjusted its size by a low resolution Thalassodromid fossil photograph (it was not good enough to use the photo as an image source, but I could calculate its proportions relative to the radio-ulna. 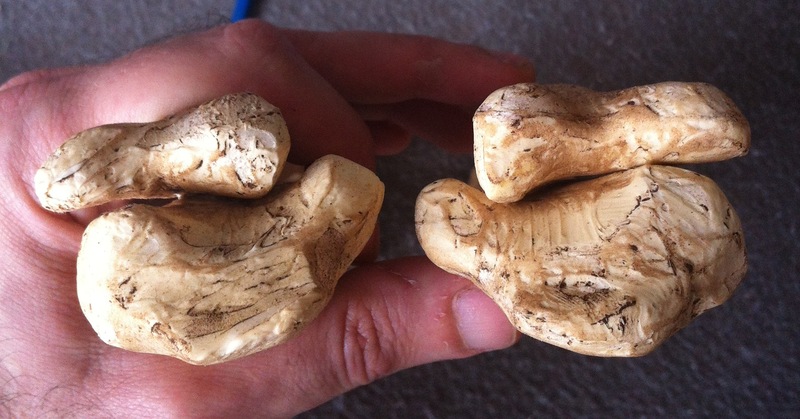 This was a first test carving just the two syncarpals, but I didn’t use it. I decided to make individual carpals. 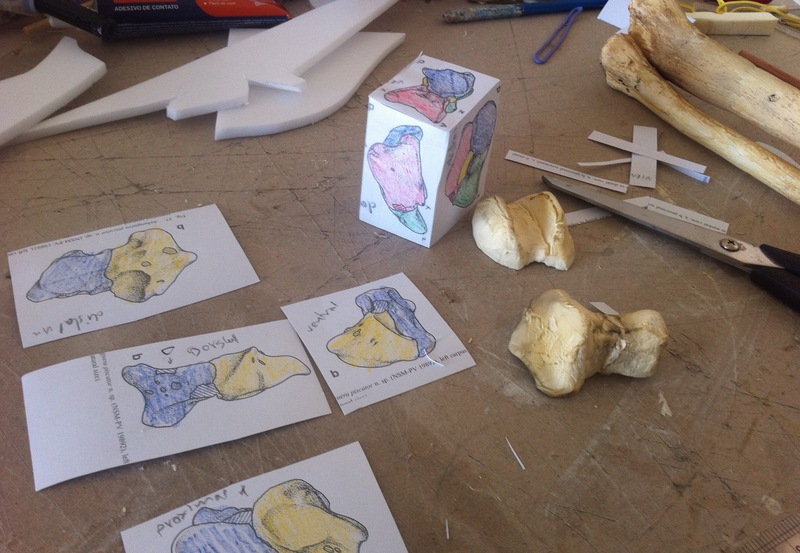 I printed the four views of each syncarpal and coloured each carpal differently to make it easier to identify them on each view. 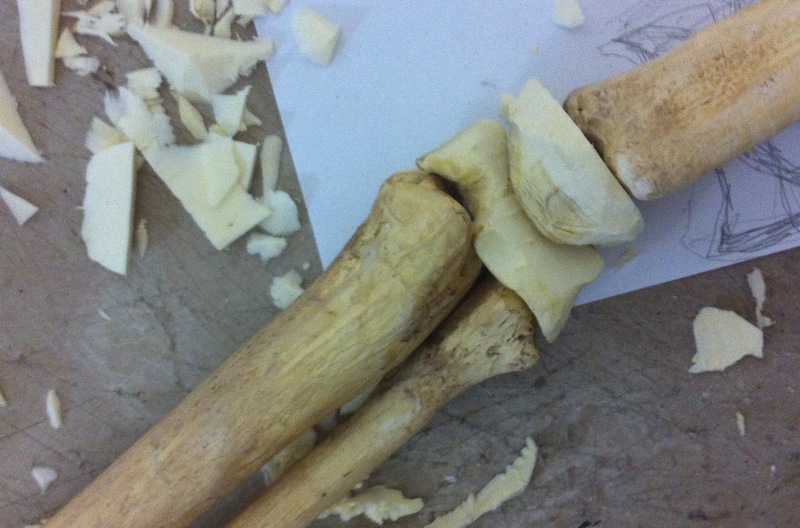 Then I carved the individual carpals from 3 cm XPS foam. These are the carpals that form the left and right distal syncarpals. 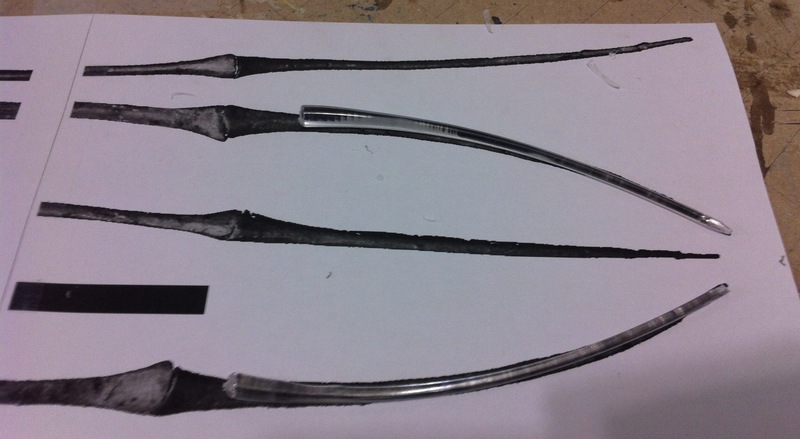 This is the distal syncarpal assembled (showing the side that articulates with the proximal syncarpal). 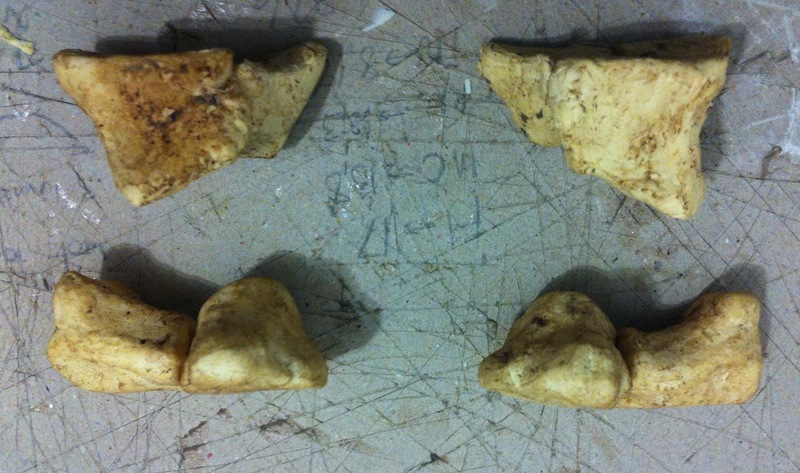 These are the parts that make the left and right proximal syncarpals. 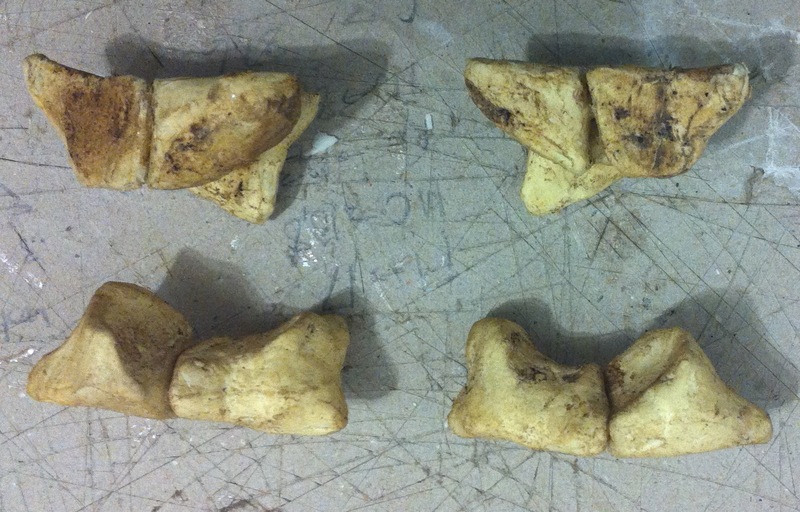 And these are the proximal syncarpals assembled. Since they are usually fused (in mature pterosaurs), I glued them together with silicone glue (which retains some flexibility). Here is a view of all the syncarpals (showing the sides that connect to each other). Now the other side. This is the side that connects to the bones (proximal syncarpal to radio-ulna, and distal syncarpal to the wing metacarpals. 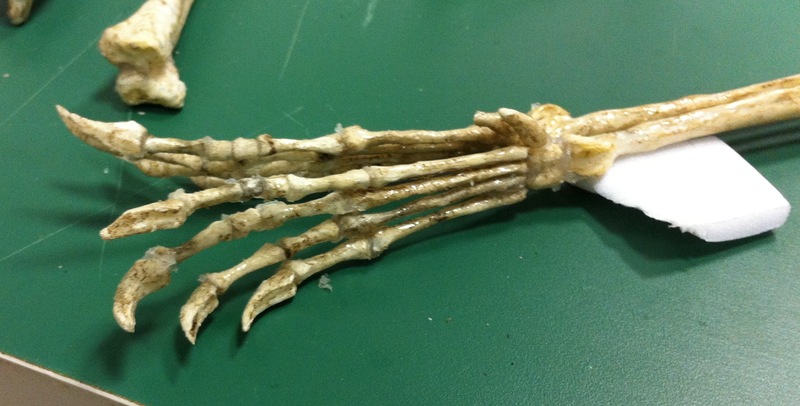 This is the distal end of the radio-ulna pair with the carpals connected. 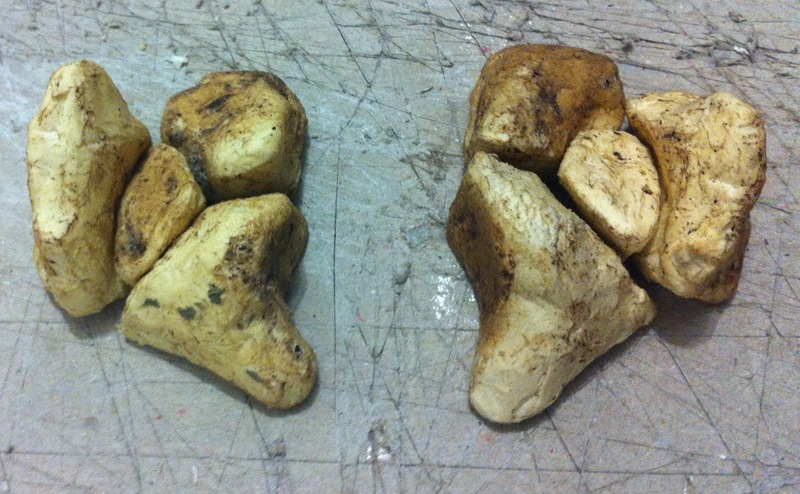 The bone that is pinned at the right is the pre-axial carpal. 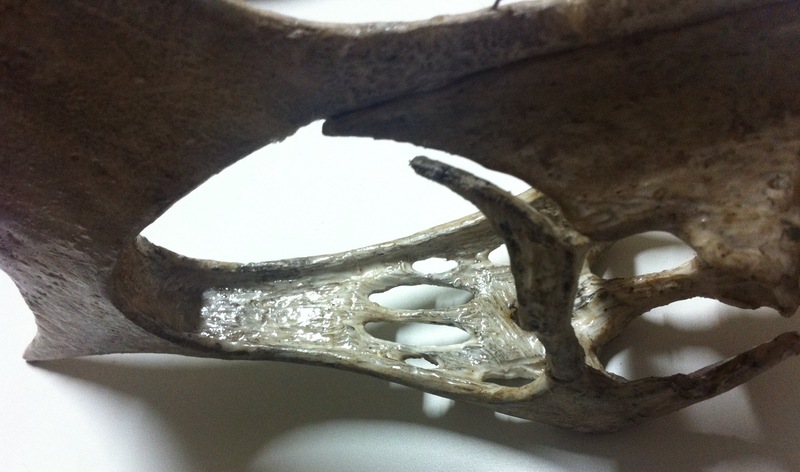 It articulates with the pteroid (via a sesamoid bone) and with the distal syncarpal. 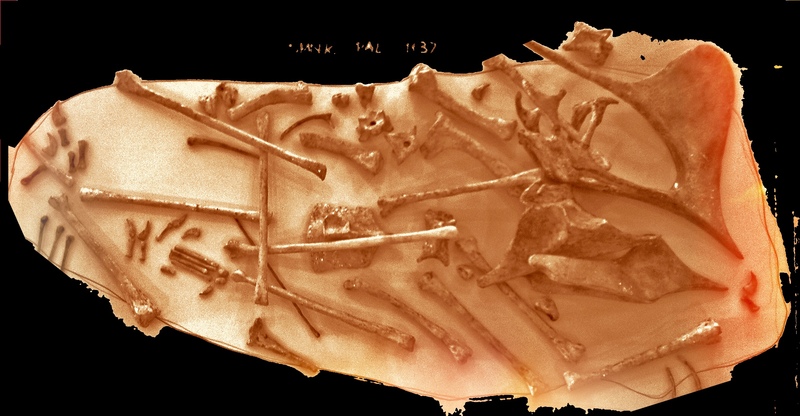 The Anhanguera specimen I used as a source didn’t have one so I “invented” one based on some photos of Pteranodon fossils (I used the article “Articulation and Function of the Pteroid Bone of Pterosaurs”, by S. C. Bennett, 2007 as a source). Here are some side views. Now the pteroid. It has a very thin and fragile tip. 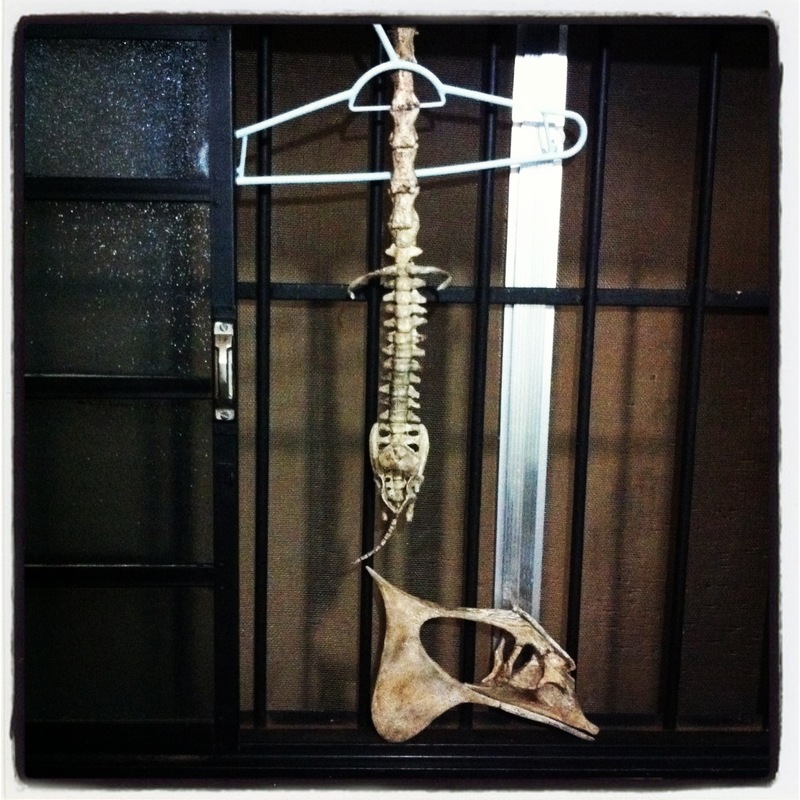 To make it stronger I stretched a piece of PVC plastic (from a plastic hanger) to serve as a bone skeleton. 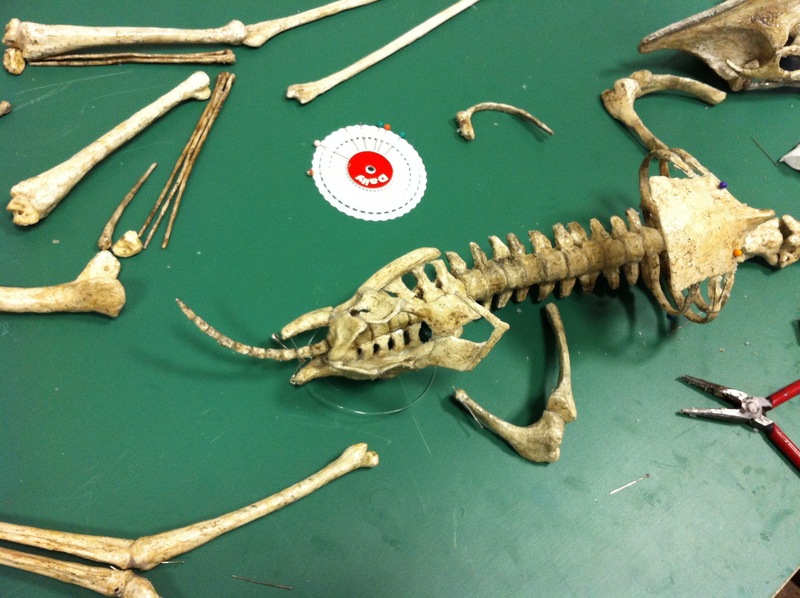 I used two halves of 5 mm XPS foam, and a plastic bone skeleton. Opened a cavity on both sides and sandwiched the plastic skeleton inside. After carving, staining, etc. 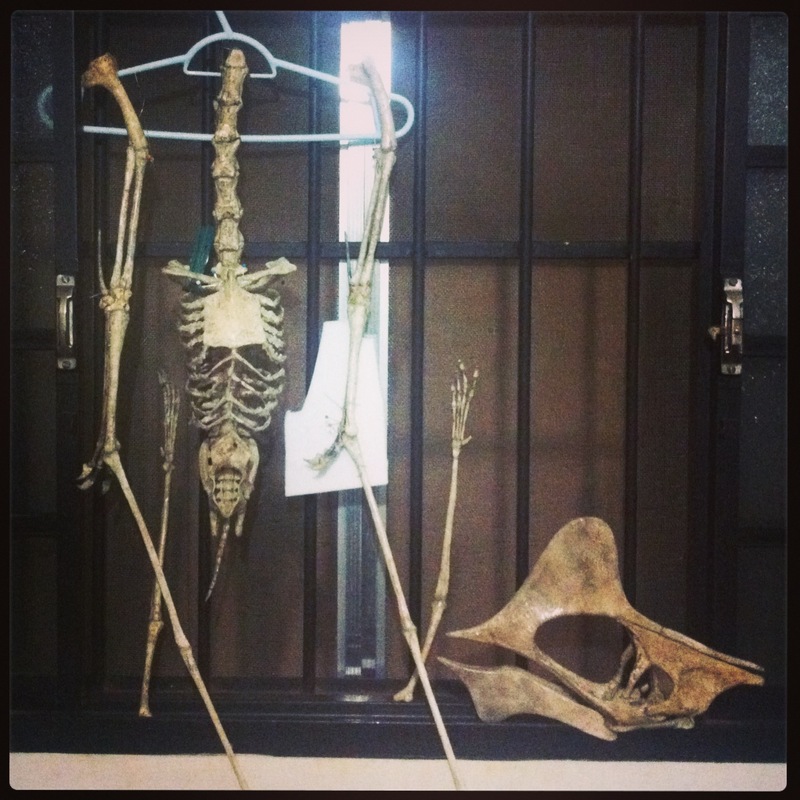 we have a pair of pterosaur pteroid. Here is the full collection partially connected. The pteroid connects to the sesamoid bone, which connects to the pre-axial carpal, which connects to the distal syncarpal, which connects to the wing metacarpal. 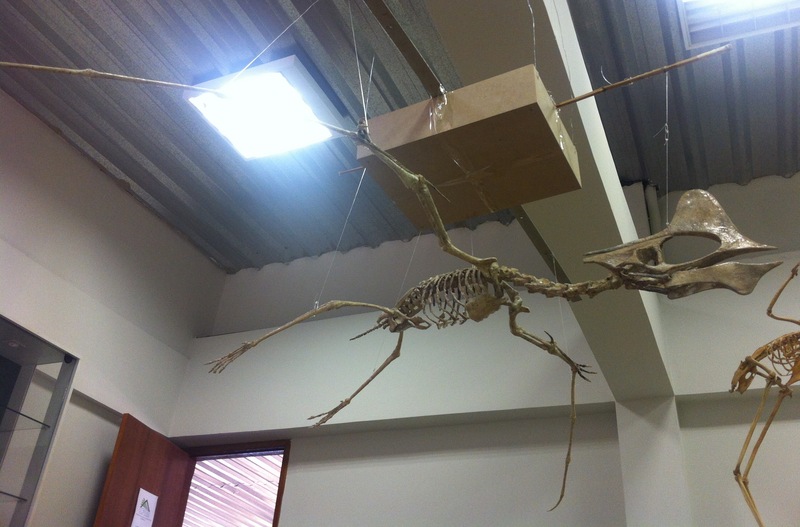 And now our Tupuxuara has a wrist and pteroid. 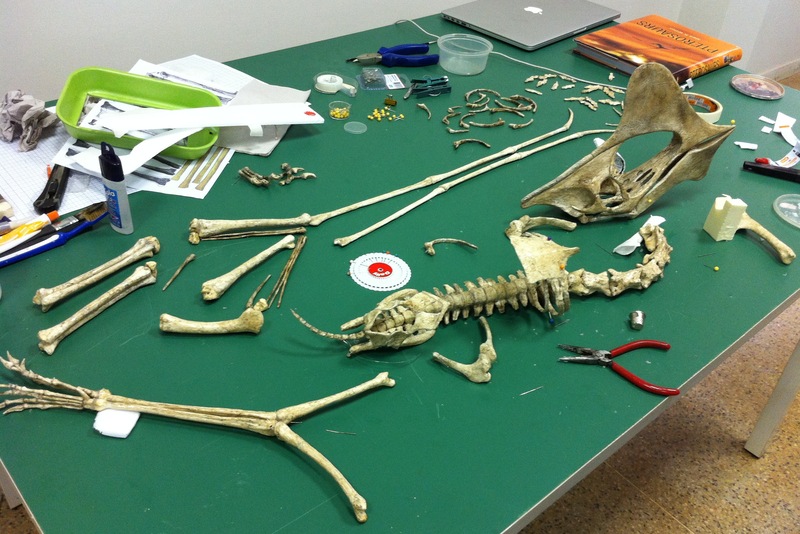 We still need fingers (including metacarpals), feet (including ankle bones), tail and pre-pubis. I’m not sure I will have time to include the pre-pubis this week. 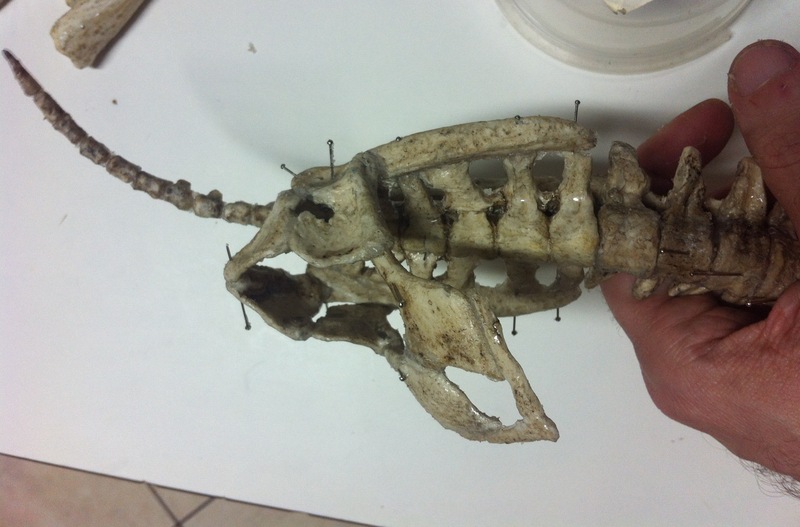 I might leave it for later when I plan to make some minor fixes and possibly introduce new ribs, gastralia and cartilage (in silicone rubber). 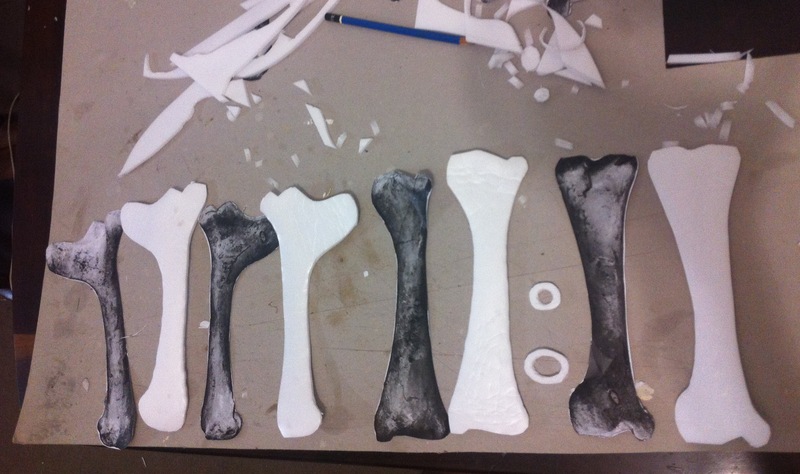 It took a couple of days to finish these bones since I had to carve many details and because the foam glue, when applied over a large surface, takes very long to dry (it’s risky to carve while it’s not completely dry). Now we only need the carpals to be able to assemble the wings. 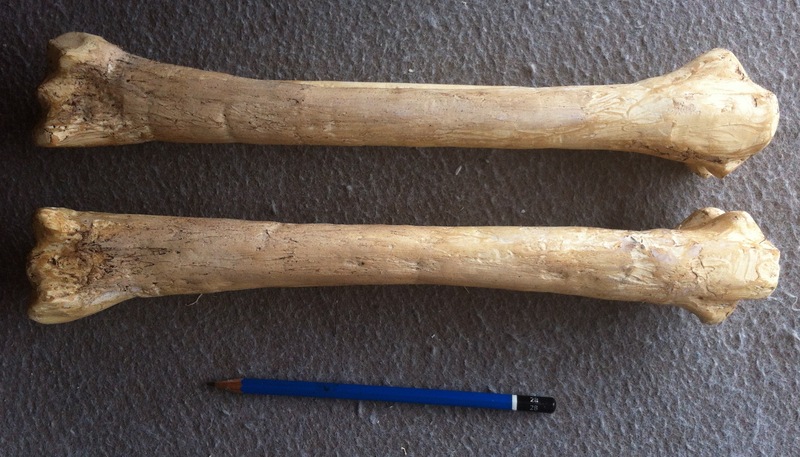 I have no source photos of the bone ends, and it wasn’t very easy to discover their shape by just looking at the other photos. 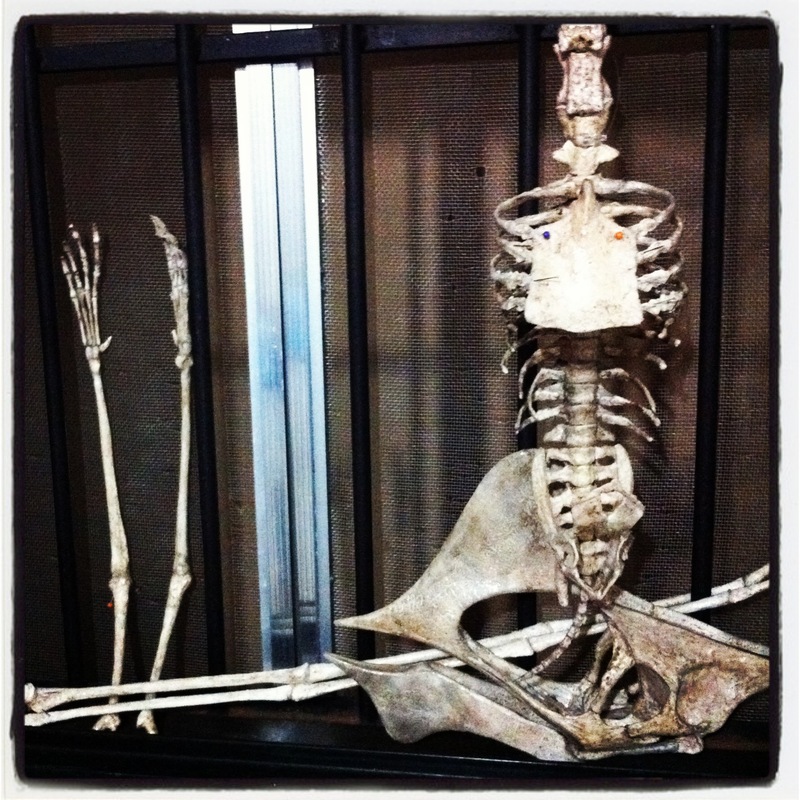 The humerus has a very complex end. I made some sketches, looked at pictures of humeri of other pterosaur species, and experimented a bit before attaching the ends. 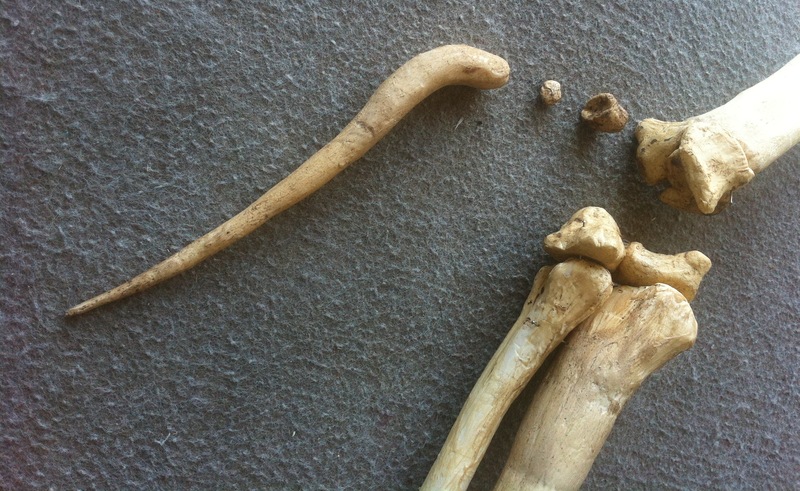 It was easy to close the shaft and the distal end of the humerus. 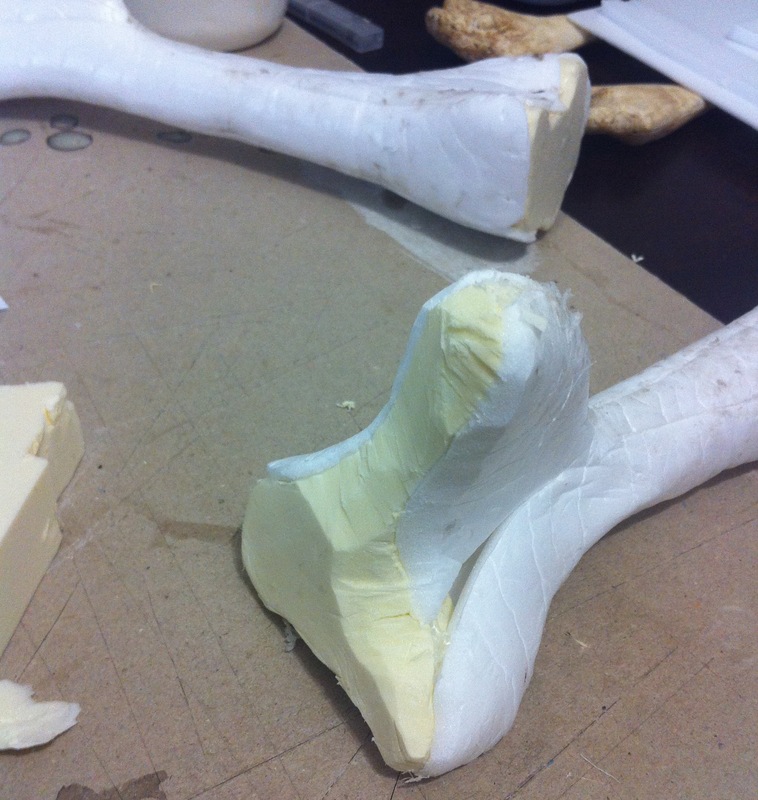 But it was challenging to sculpt the proximal end. After some trial and error, I had something like this to start working. 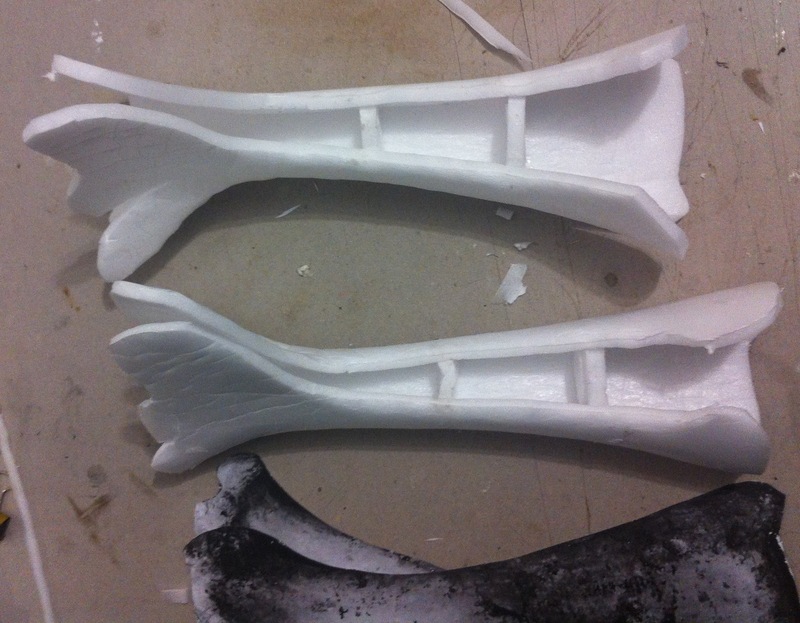 But then I still removed and added foam until I finally had a shape that matched the side views. 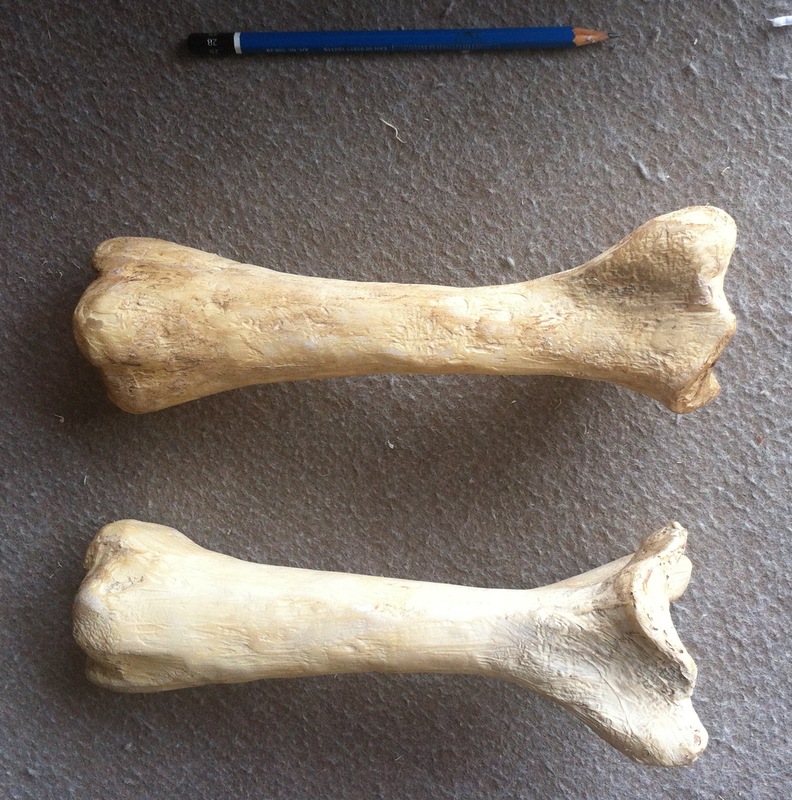 After I finished one bone I used it as a reference, so the second humerus I made much faster. 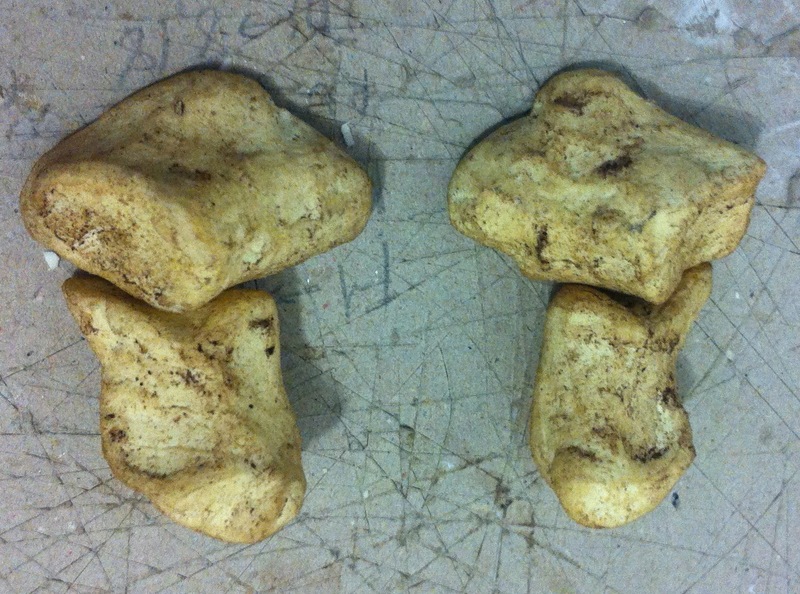 Here are some pictures of the result showing four sides of the humerus. The pencil is 16 cm long. Both are approximately the same side. The angle the photo was taken may make one seem larger than the other in some views. 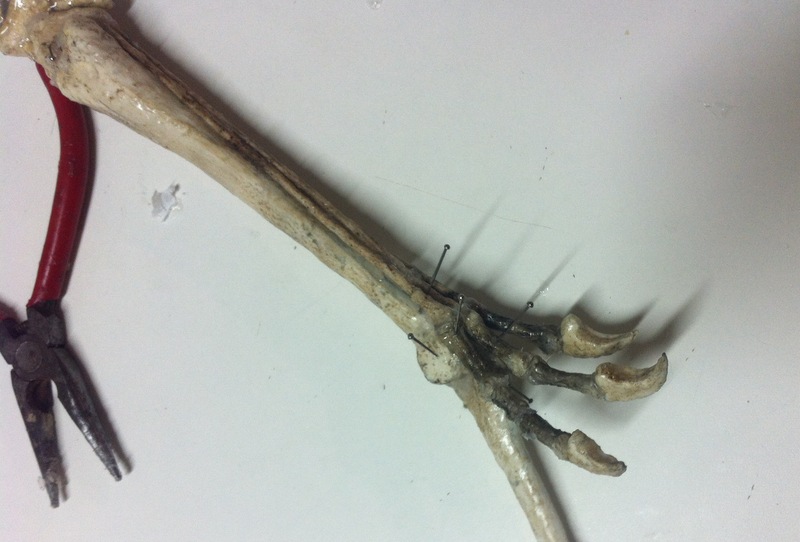 This is the distal end (the end that connects to the radio-ulna pair). It’s speculative (I invented it using the side views as a source). 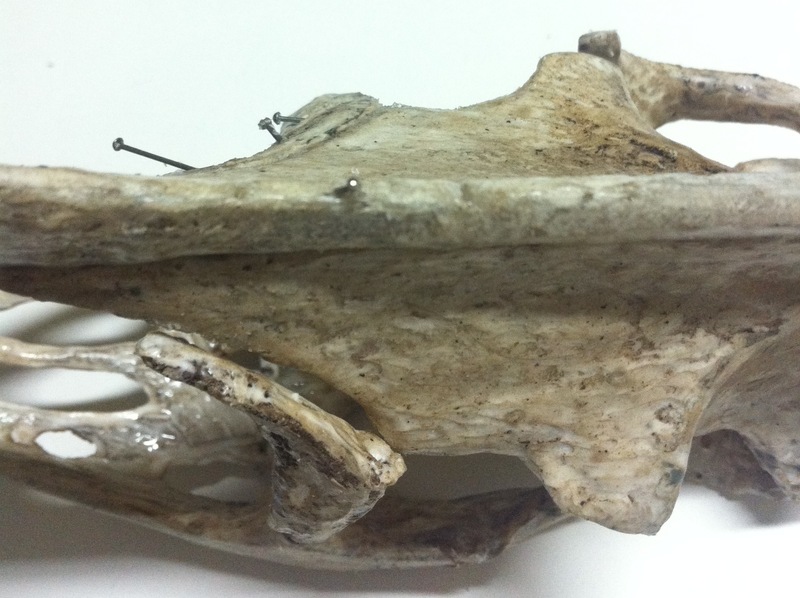 And this is the proximal end, which connects to the shoulder (scapulacoracoid). It is also speculative. 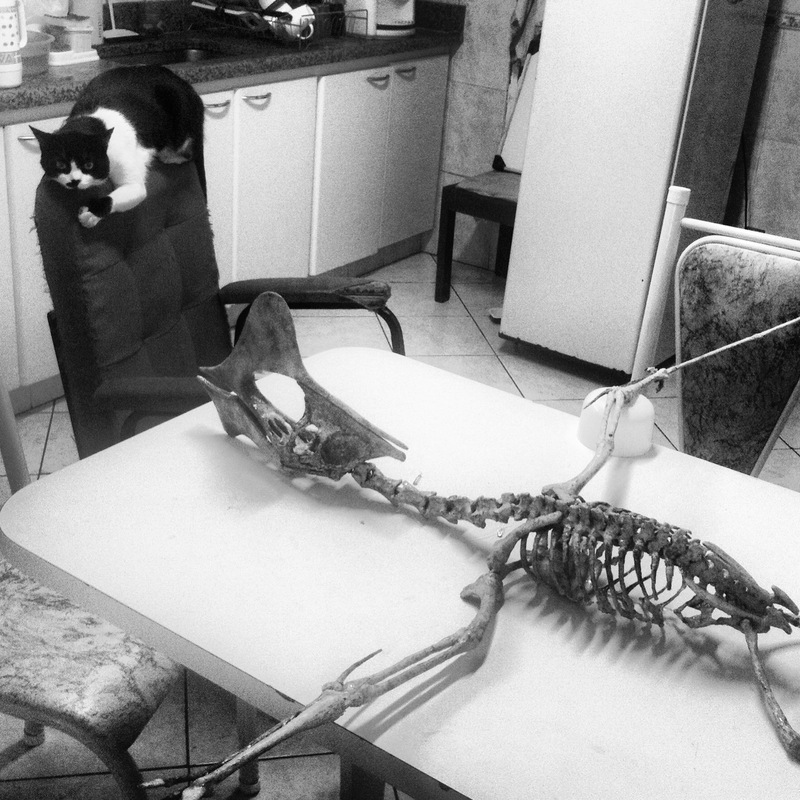 I might make adjustments later when connecting the bones. 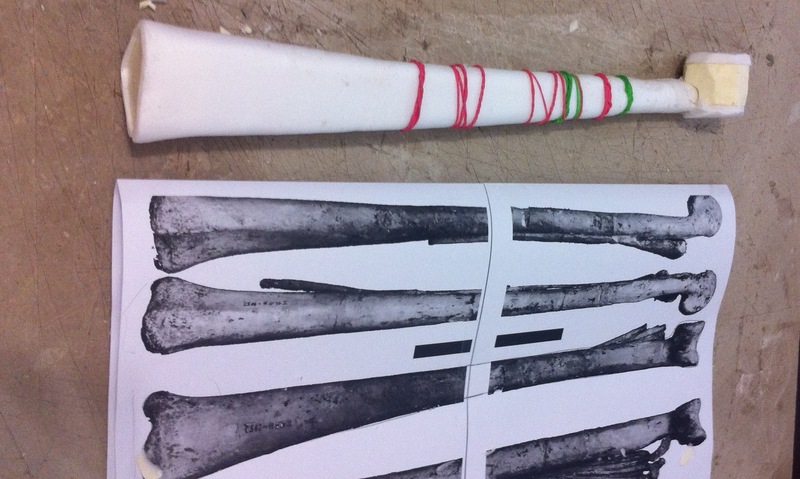 Now the radio-ulna pair. I wasn’t able to trim the radio bone’s shaft to its correct width. The technique I used (see last post) was not a good one. 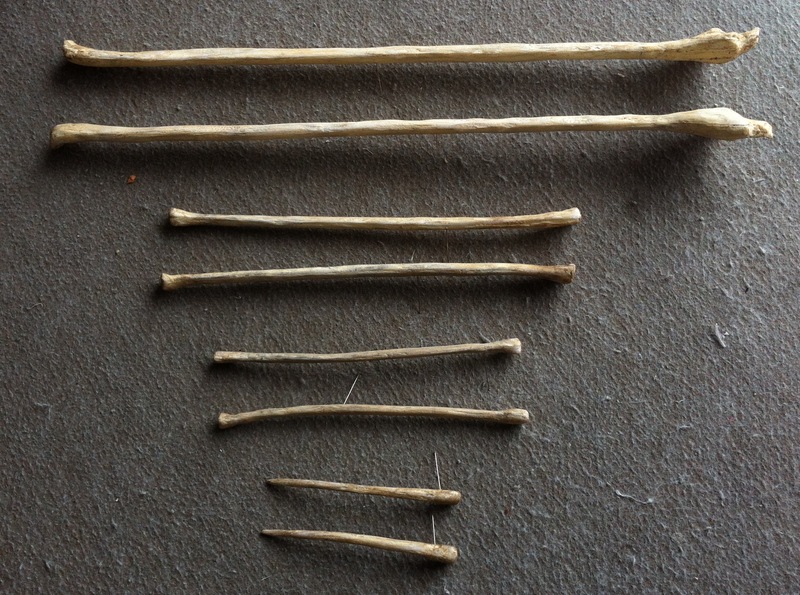 So I tore the shafts apart, preserved the bone ends, and made new shafts by rolling thin (2 mm) foam. 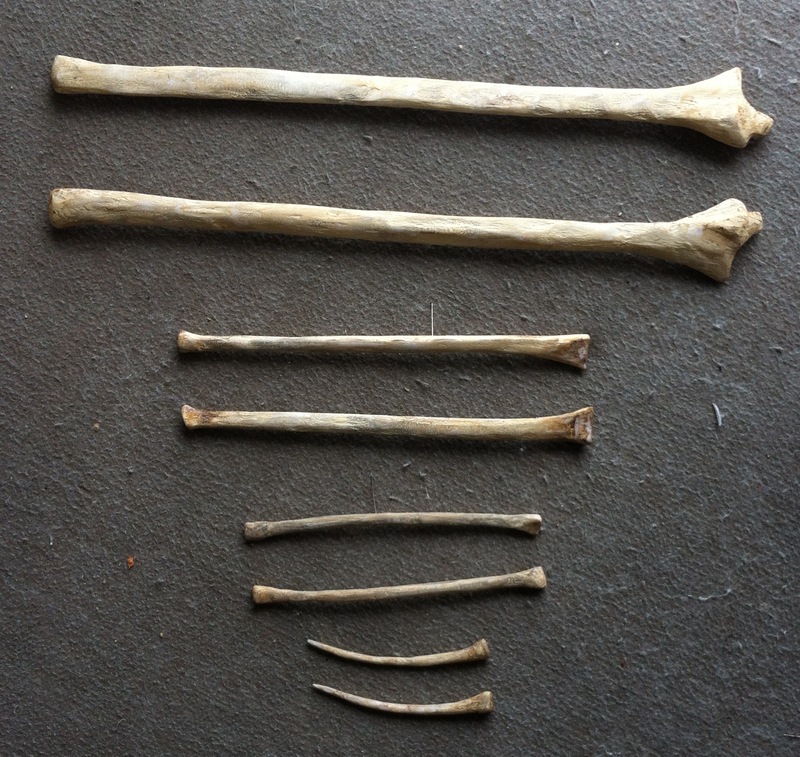 Here they are attached to the bone ends. And now some photos of the final results. 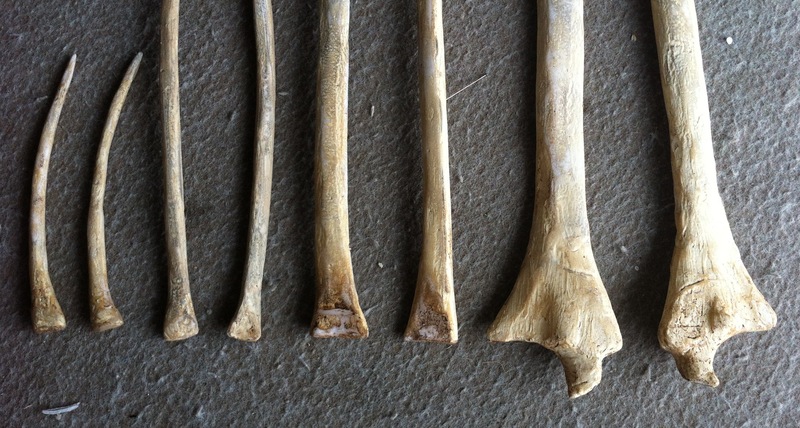 The bones are not yet connected. I just pinned them together for the photos. These are the sides that fit together. 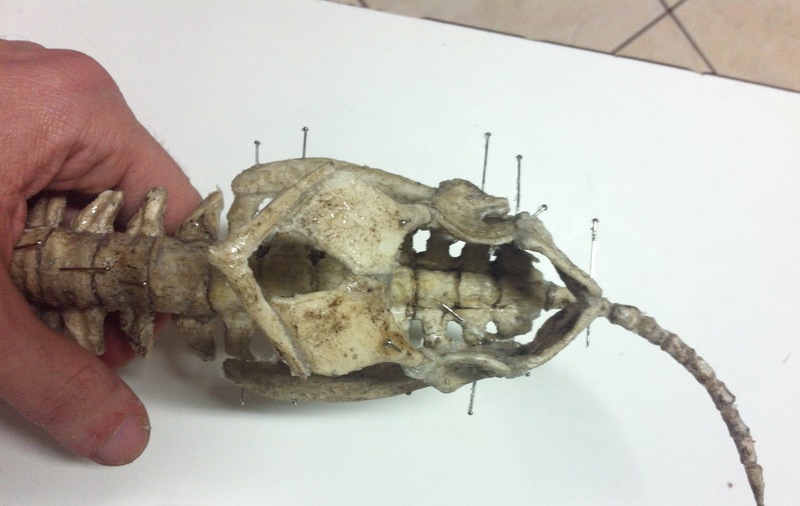 The proximal and distal views are speculative since I don’t have any photos of them. They were derived from the side views. 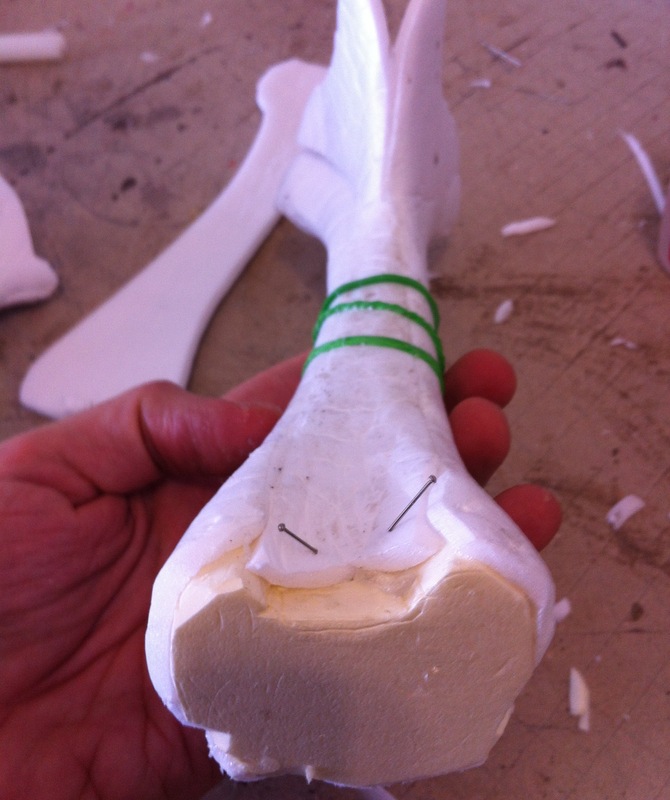 This is the proximal end (which connects to the humerus). 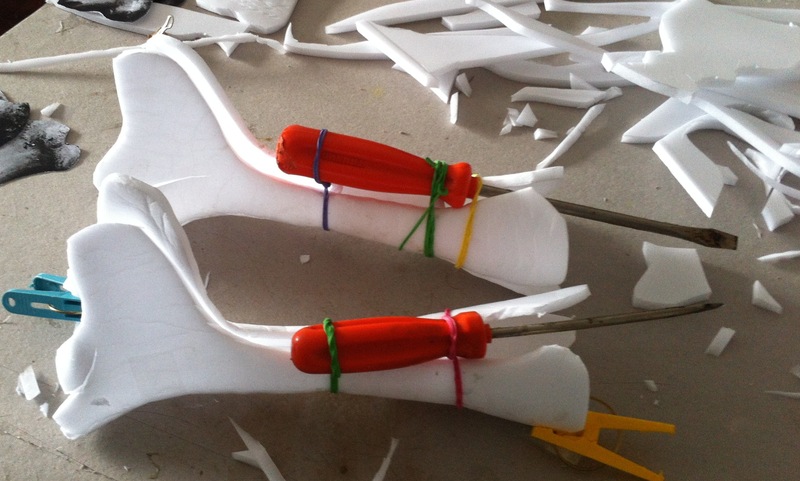 Now we can assemble the wings. 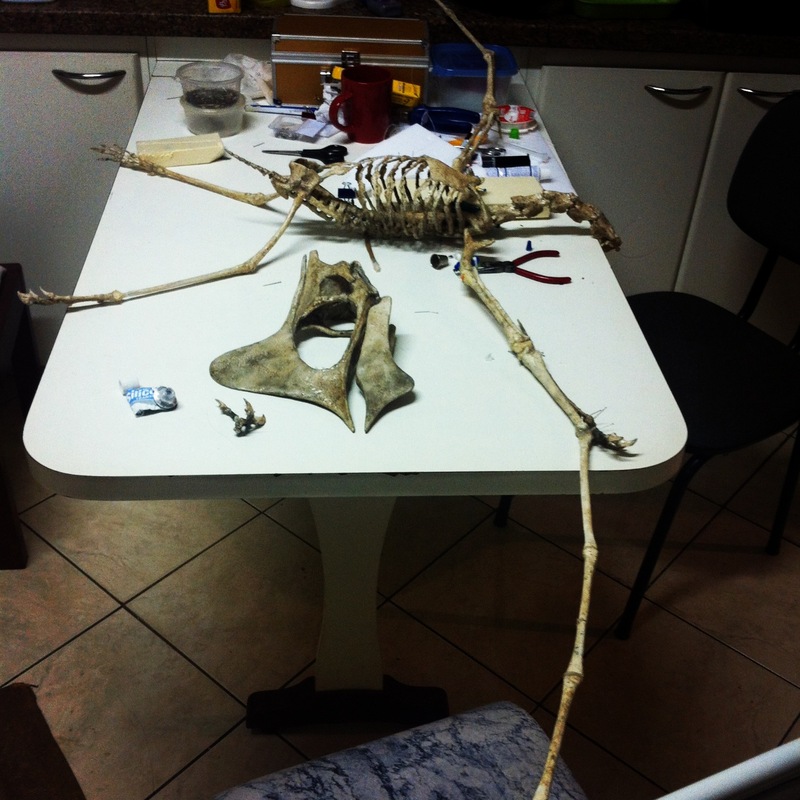 I still can’t connect the bones because the carpals (between the wing metacarpal and the radio-ulna pair) are still missing. Here is a picture of Tupuxuara so far. 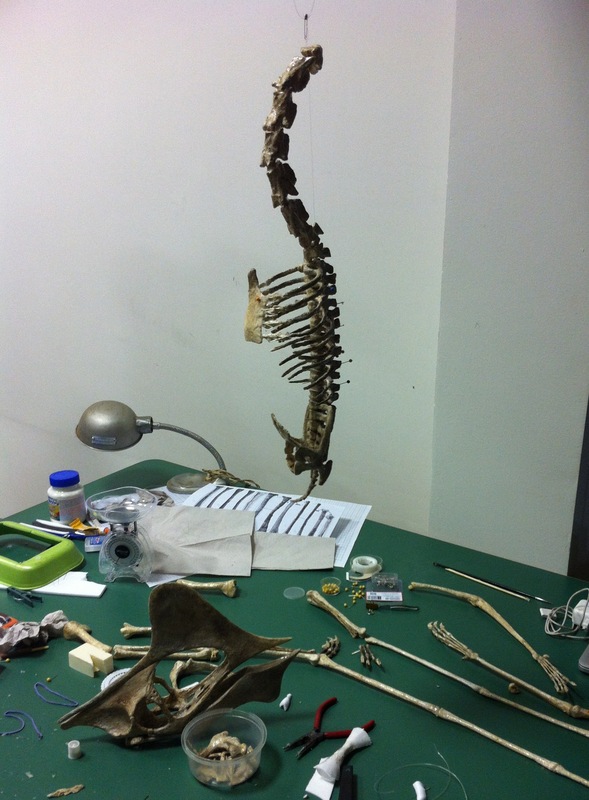 I’m now working on the carpals, pelvis and leg bones. 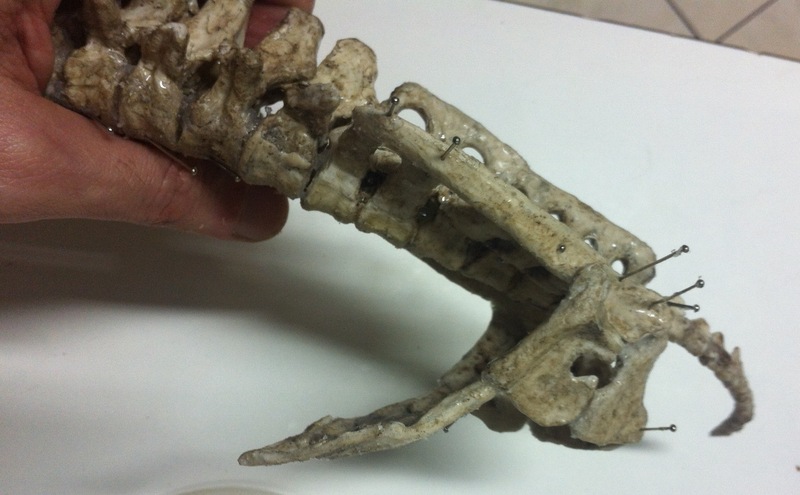 Tupuxuara has four metacarpals. One for each finger. The fourth finger, of course, has a larger one. 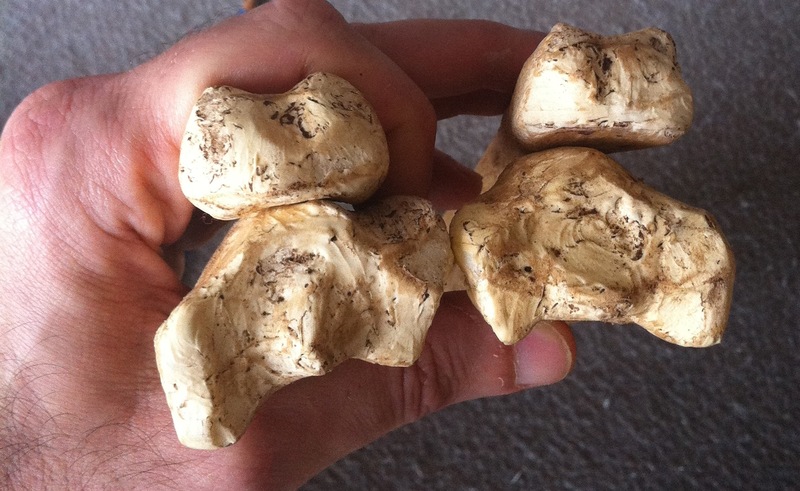 This post is about metacarpal #4. We only have four views of each one. 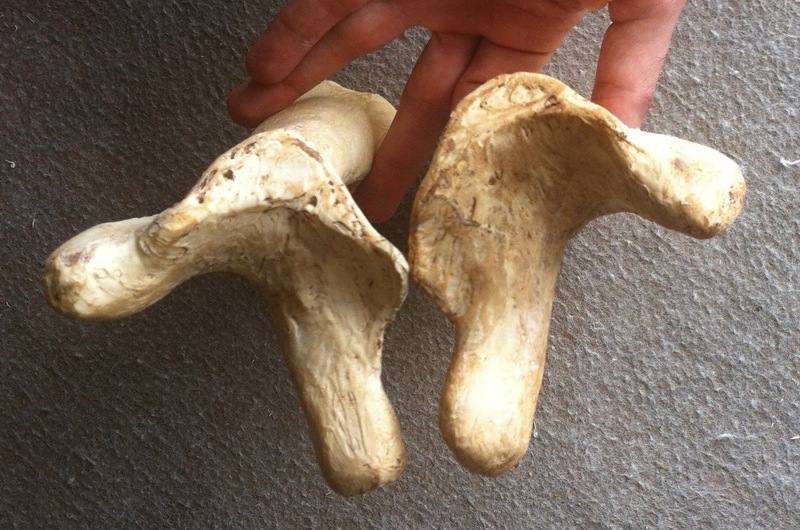 Very good pictures, but no distal and proximal views of the bone ends. So I have to guess what they look like from the pictures. 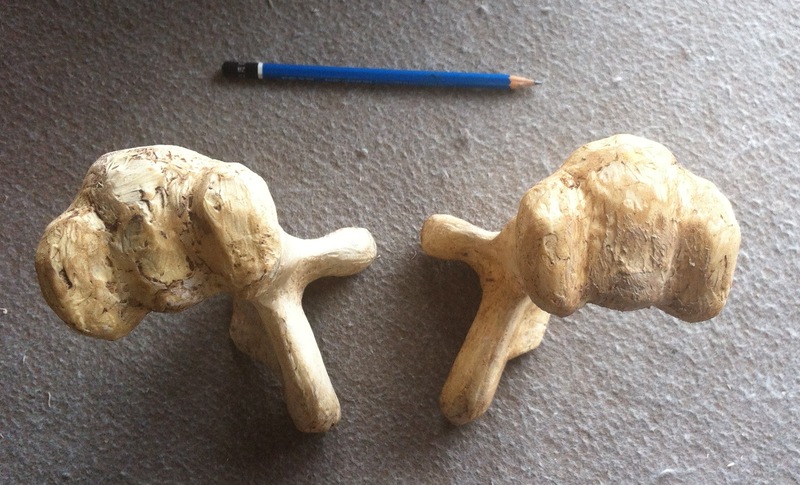 The bone shafts are somewhat cone shaped, a bit flat on one side, narrow and rounded near one end (distal) and triangular at the other end (proximal). I started with a sheet of 5 mm foam for each one. Folded and twisted until I could roll it into shape. Rolled it. Held everything in place with rubber bands. 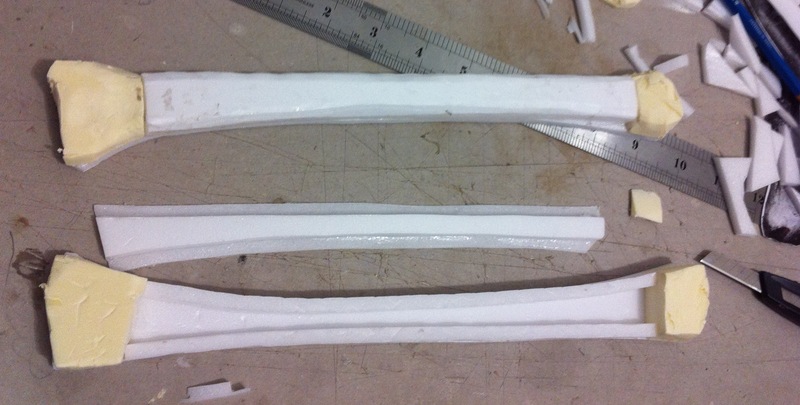 Then I made the bone ends with thicker (3 cm) XPS foam. 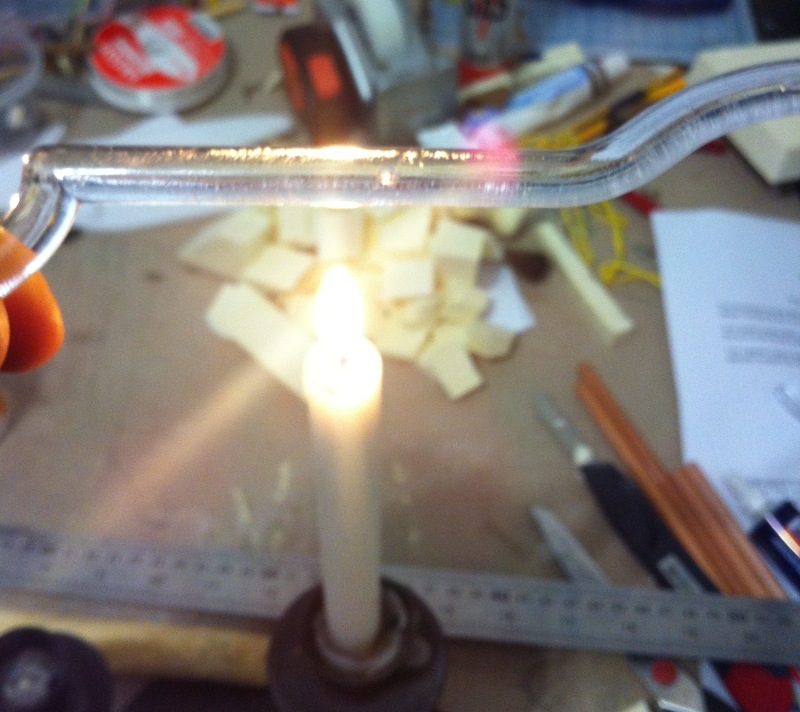 I made the shaft slightly longer so I could insert it into the wheel-shaped distal end. When they were dry, I did some trimming, shaping and texturing with a knife and a lighter. And this is the result. Four views. 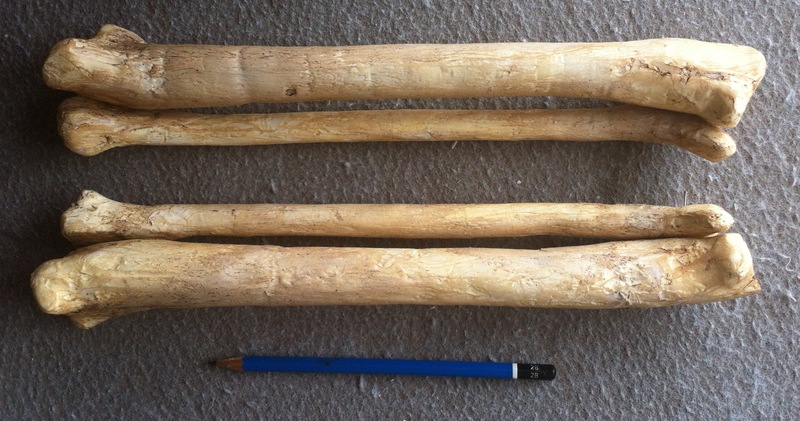 The pencil is 16 cm long. 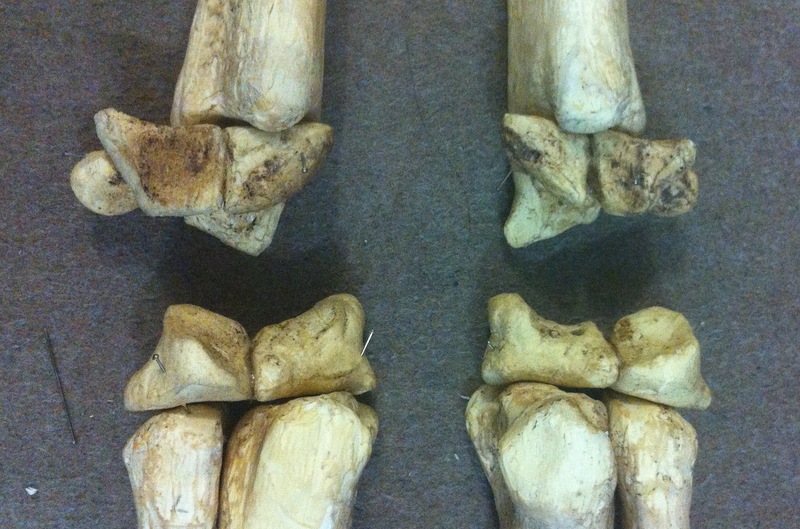 This is the distal end (the end that connects to the first phalanx of the fourth finger). And this is the proximal end which connects to the distal carpal (wrist). That’s only one metacarpal. I need three more for the small fingers. They run parallel to the big one and are connected through cartilage and muscles. 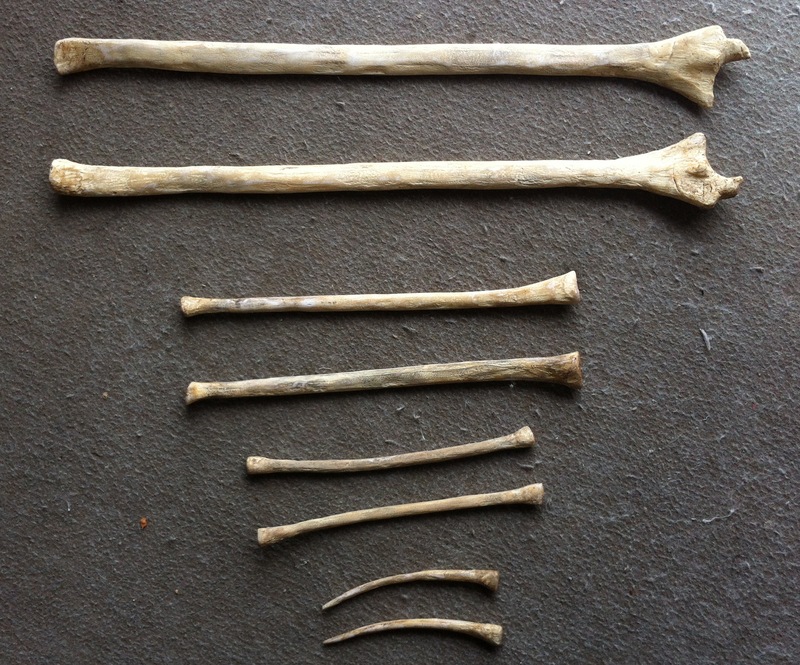 But I will finish the humeri and radio-ulna pairs before making them. 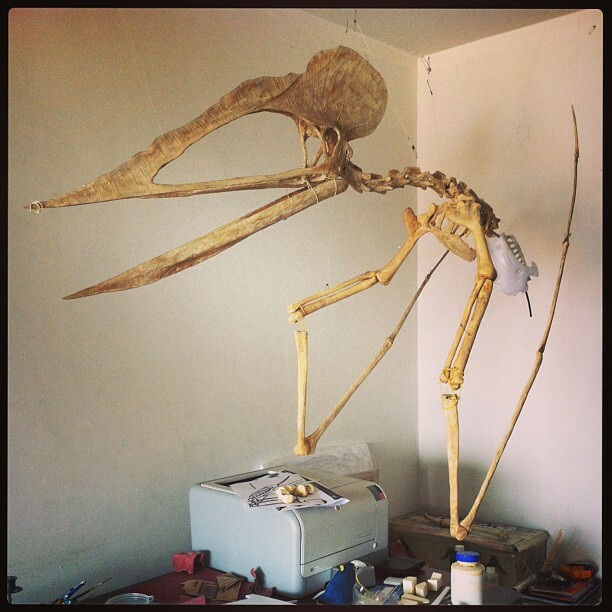 Tupuxuara belongs to the sub-order Pterodactyloidea, therefore you can call it a pterodactyl, which means wing (ptero) finger (dactylus). 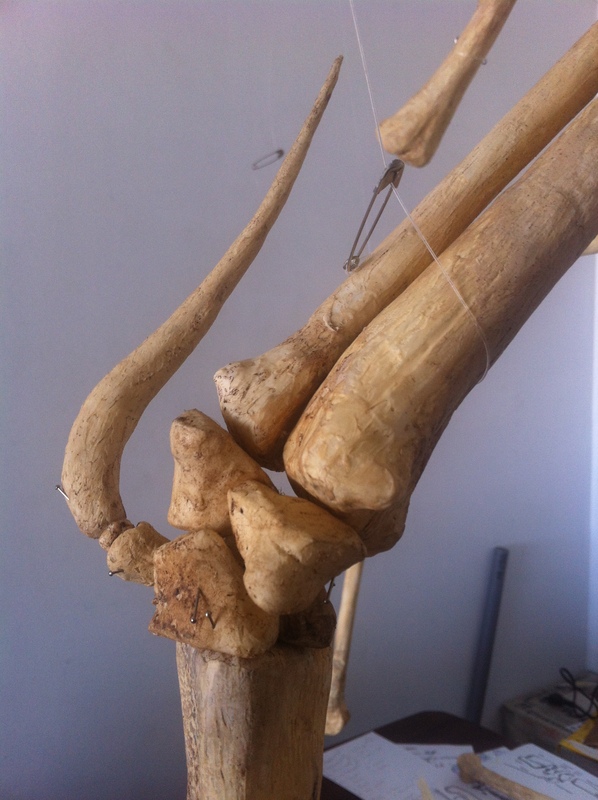 In this post I will describe the making of the four phalanges of Tupuxuara’s very long fourth finger. 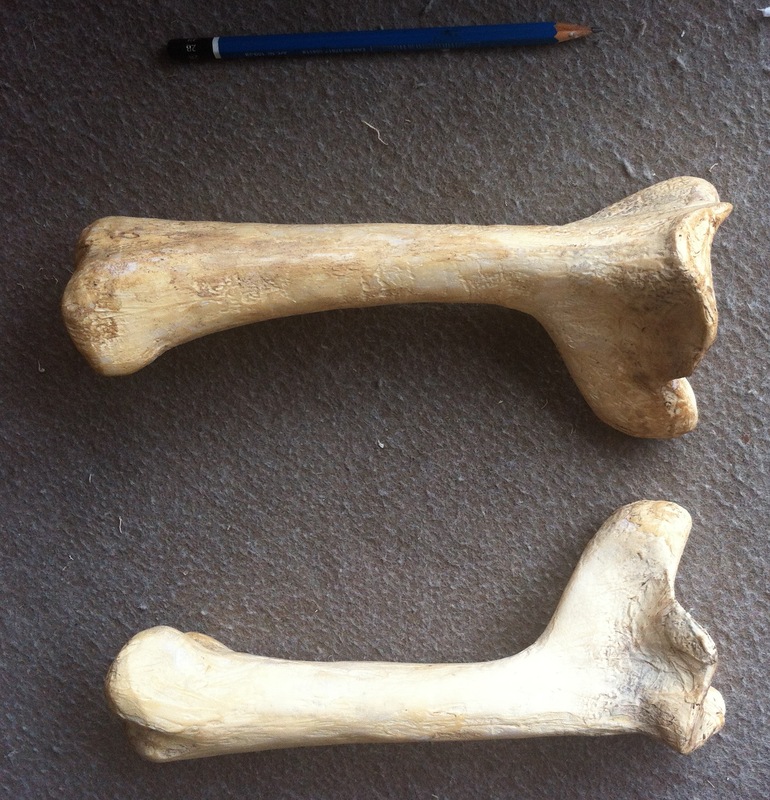 The arm bones and fourth metacarpal are thick and have a quasi-cylindrical shaft, but the wing phalanges are very thin, have a flattened shaft and seem very fragile. 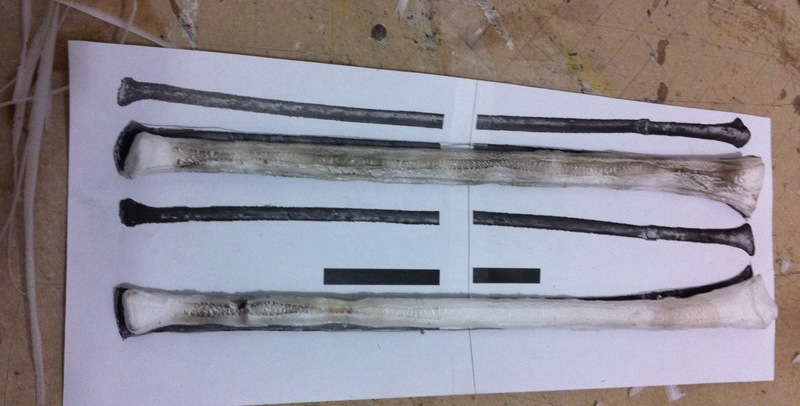 I experimented making a hollow shaft for the first phalanx with 2mm foam, but I felt it would be too fragile. I could fill it with scraps of melted foam which would give it strength (like in real bones) but I didn’t find a practical way to get the foam uniformly all the way through. 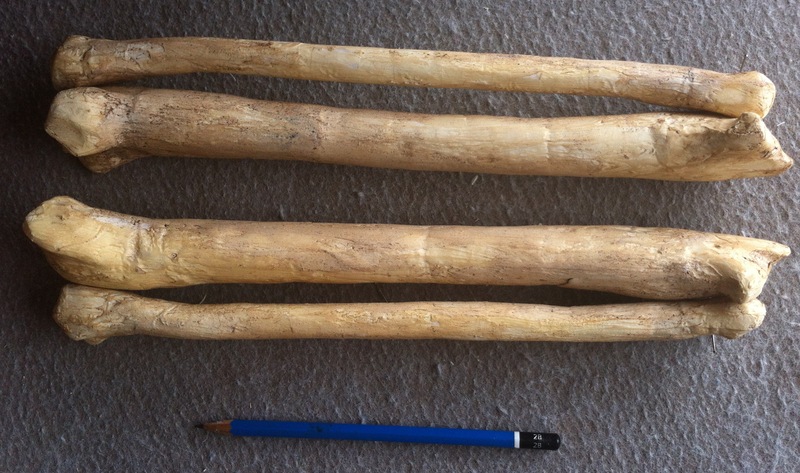 So I abandoned the hollow bone technique for these four bones and decided to make them with strips of 5mm foam. But the strips wouldn’t be enough. The solid bone is even more fragile. So I decided to reinforce them with plastic. I even considered making the small ones completely out of plastic (like I did Anhanguera’s teeth), but it’s easier to shape and fix mistakes on foam than on solid hard plastic. 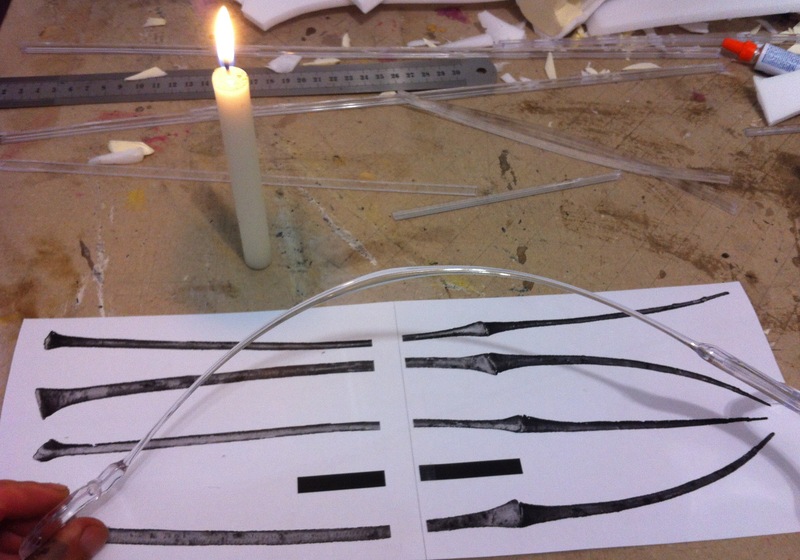 Starting with the fourth phalanx, I stretched a piece of round plastic hanger over a candle to reduce its diameter, and used it as a bone skeleton. 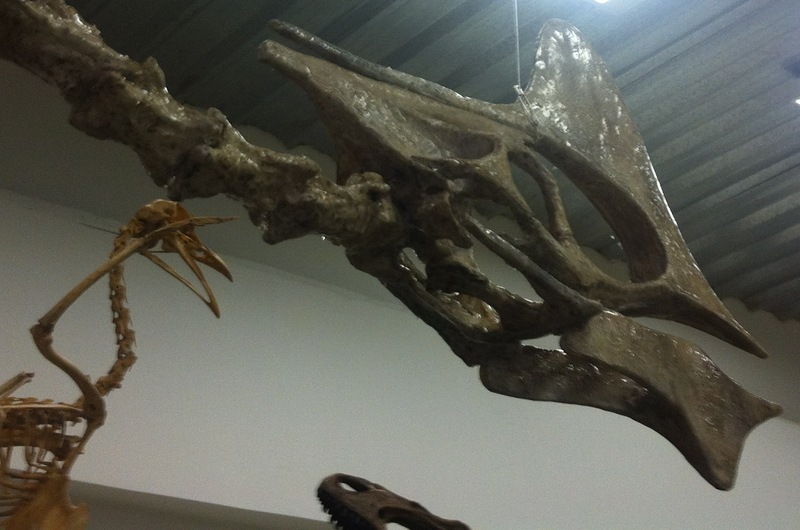 You can see how I do this on the posts on pterosaur teeth. 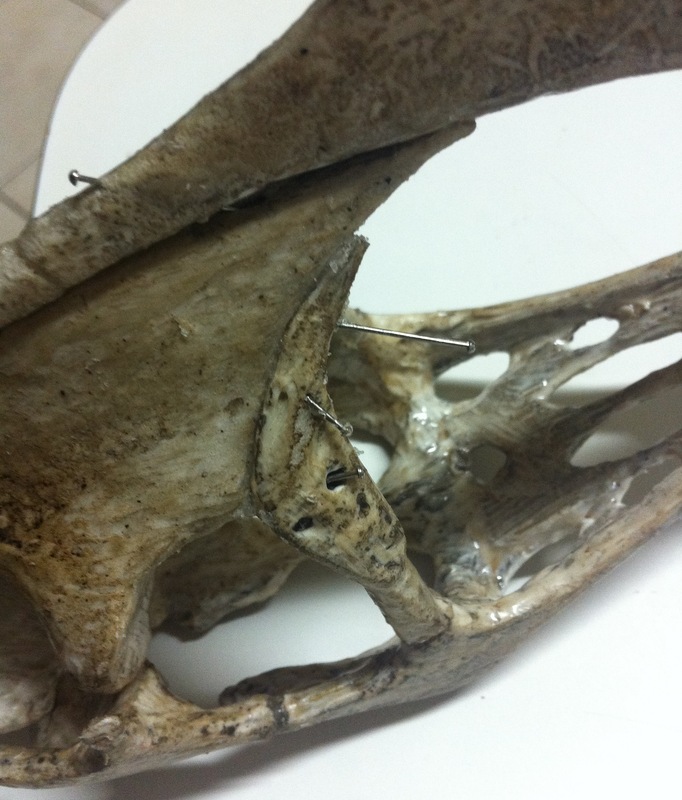 I used two parts 2mm thinner in diameter than the actual bone which you can see in the picture below. 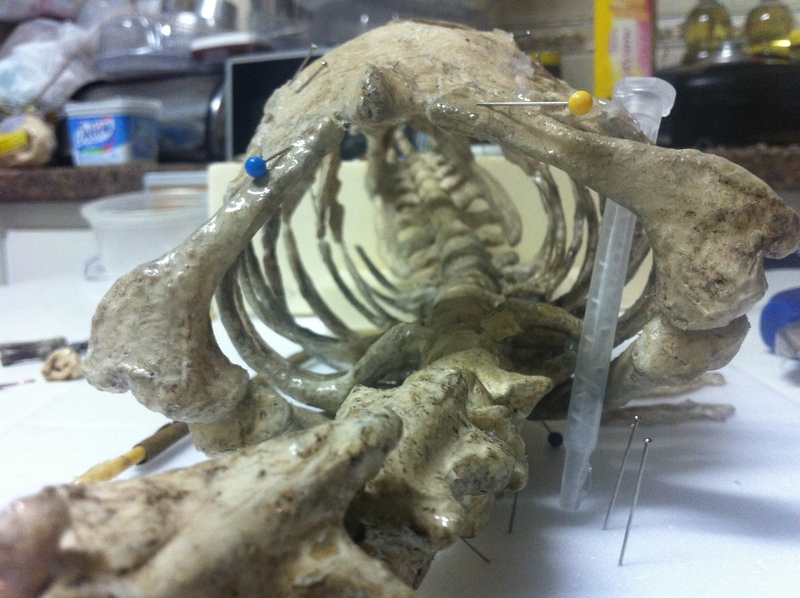 This bone is also a bit flat but I wasn’t able to make the plastic structure flat. It had to be compensated with the foam cover. 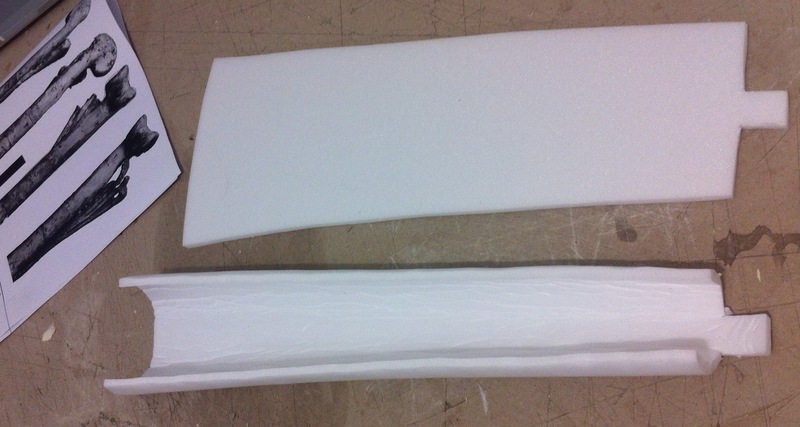 I cut a strip of 5mm foam, made a slit inside it like this. I tested fitting the plastic inside it, stretched the foam a bit, and made another one. These are the two phalanges #4 before assembly. I glued them together using hot glue, trimmed, sanded, finished with some fire. This is the result. It is still too thick (specially on the sides). I don’t know if I will be able to make it as flat as it should be. I might have to use a sanding machine since the plastic is very hard. Of course, it’s much heavier than it would be if hollow, but it won’t crack. In phalanx #2 I added a flat piece of foam (also from a plastic hanger, but a of different kind). I used the candle to shape it according to the curvatures of the bone. I repeated what I did with phalanx #4. 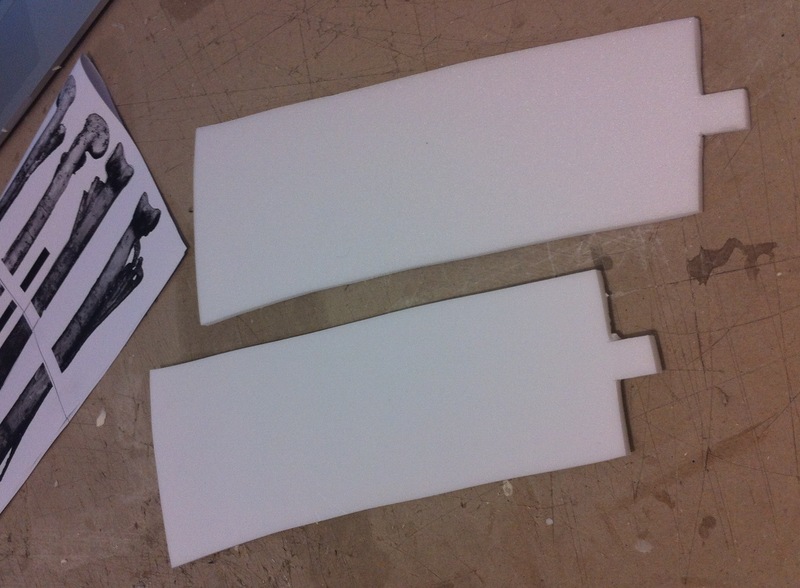 Cut a slit and placed the plastic in the foam. 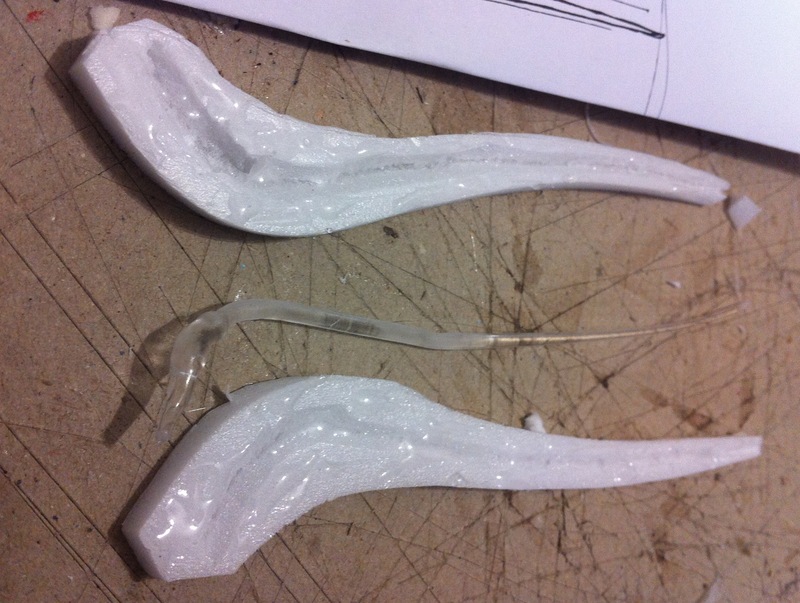 After pasting, trimming, sanding and burning, here are the two last phalanges of Tupuxuara’s wings. Now phalanx #2. Same technique. 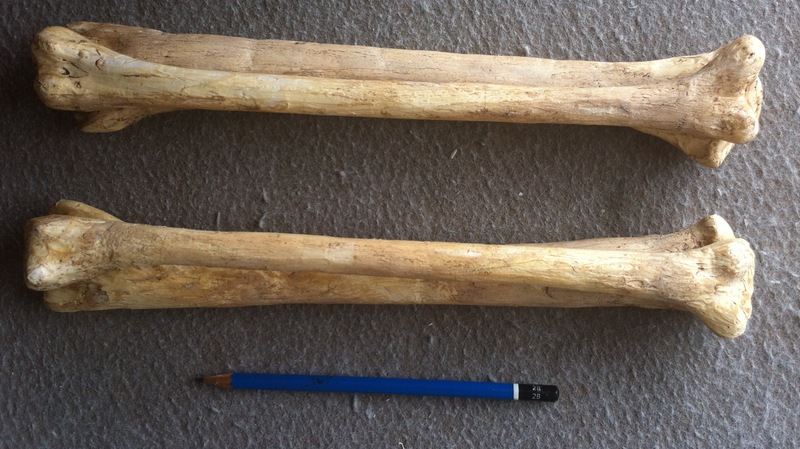 There is more foam this time so I will have some space to shape the bone better (the shafts of phalanges #3 and #4 were practically exposing the plastic). 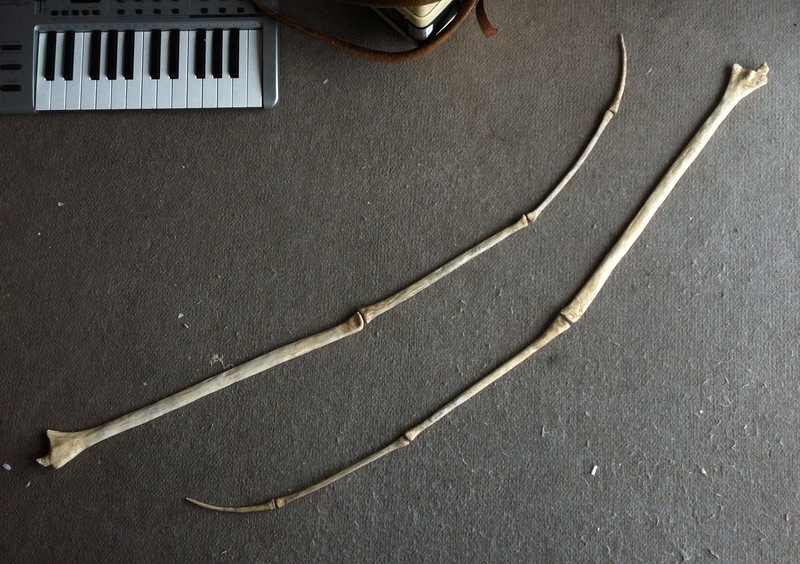 Here are phalanges #2 after trimming, pressing, sanding and burning. And the wing so far, after the foam work. 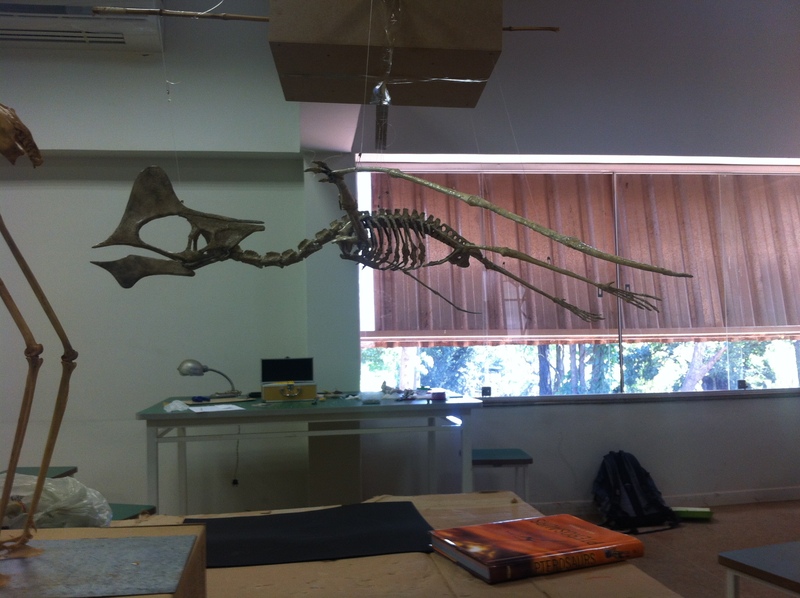 Phalanx #4 is the longest bone of the wing. 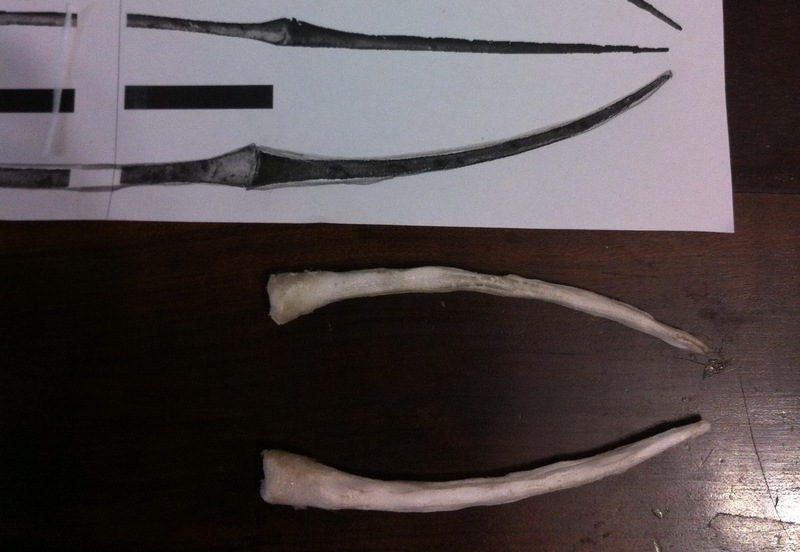 It’s larger end (proximal) articulates with the wing metacarpal, which I haven’t made yet. This one could be hollow, but it would be too much trouble, so I decided continue using the same technique. The plastic hanger I used has a structure with “H” shaped sections. 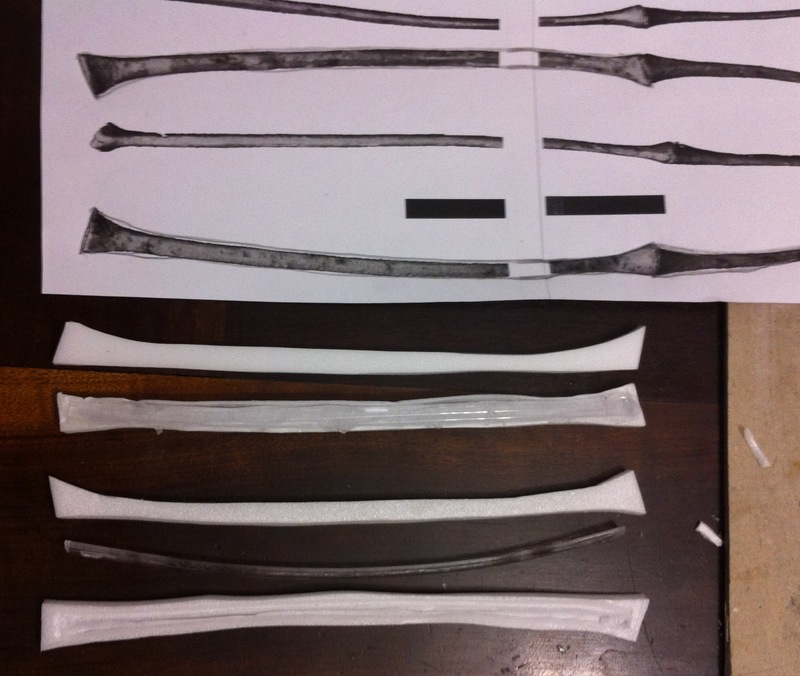 I cut them in half lengthwise (making “T” shaped sections). 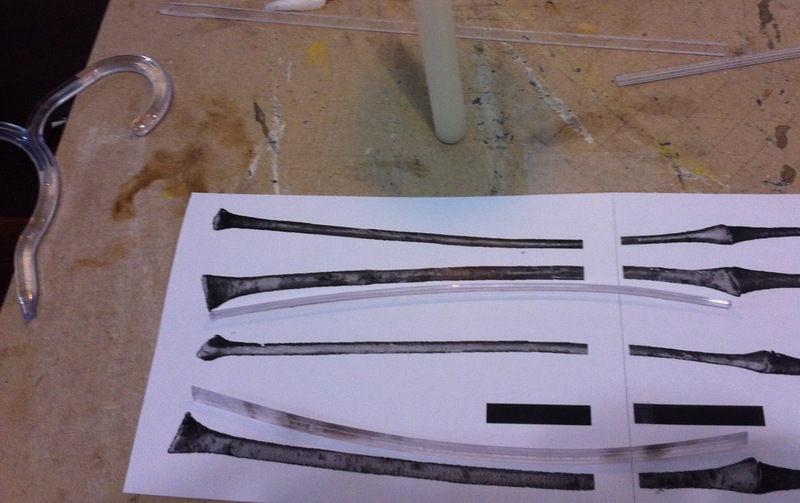 I used that “T” strip as the bone skeleton for phalanx #4. 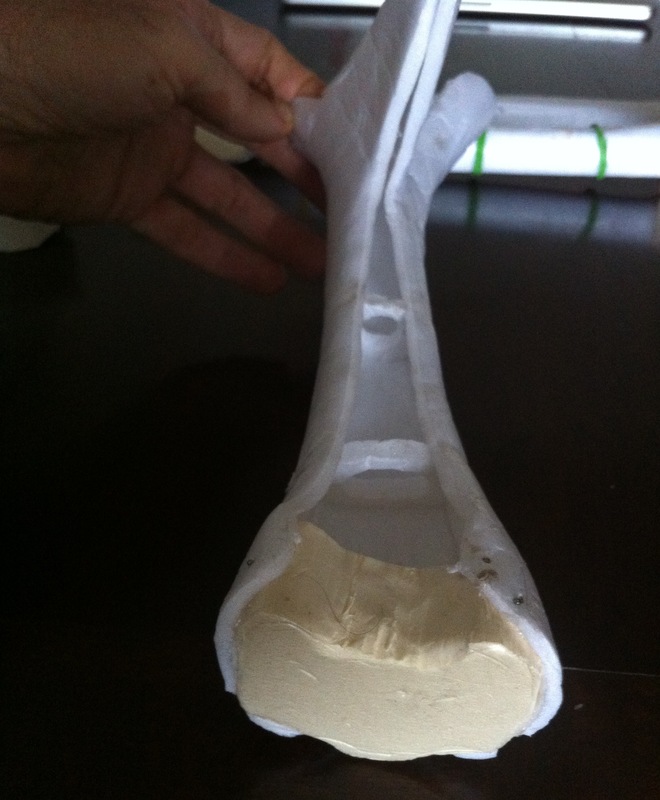 The bone is practically straight (the curves are on the foam edges) so I didn’t have to curve the plastic. 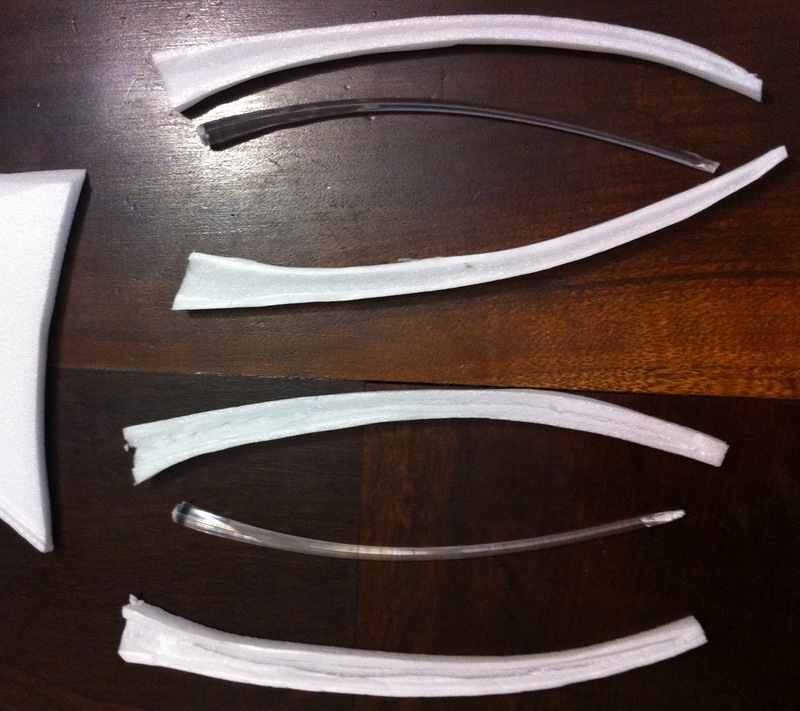 I sandwiched the plastic with two 5 mm thick foam strips. But the bone is not that flat. The proximal end has some bumps and prominences. They rise about 3mm on one side and some 7mm on the other I added an extra layer of 5mm foam on each side to carve them out, then I twisted the ends a bit to shape them according to the pictures. Here is the final result. Four views of the four phalanges of the wing. This is the view from behind (considering the position in the wing). And this is the front view. 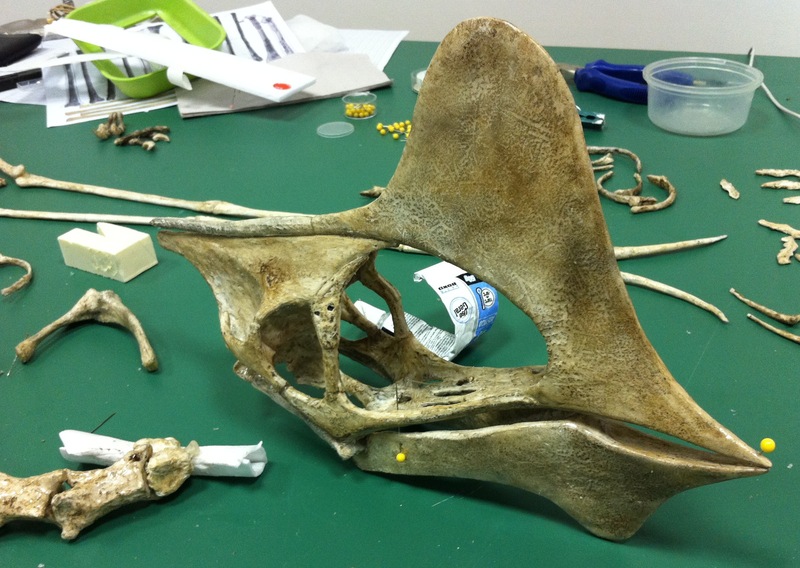 I might be wrong about which side is ventral or dorsal. 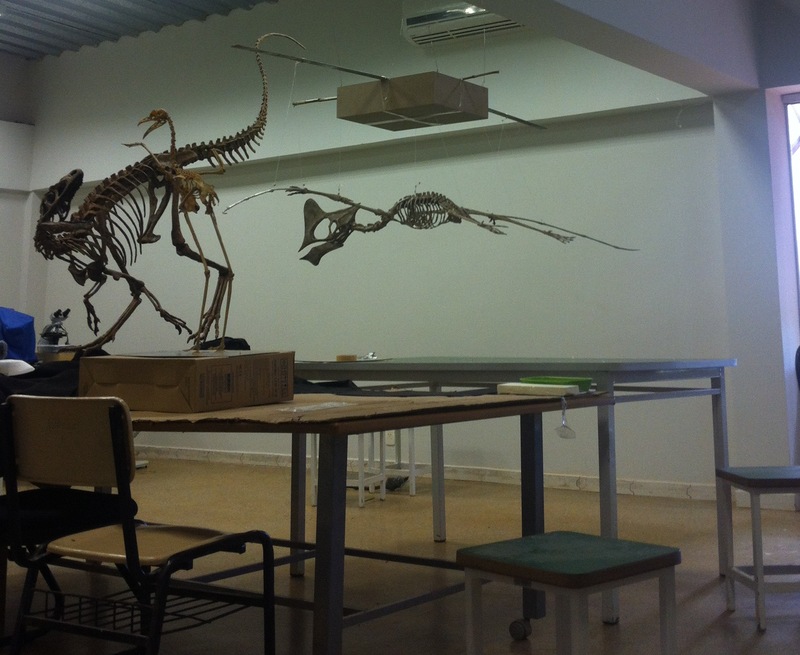 I still don’t have all the information I need to assemble the pterosaur. If I am wrong, I will update this. 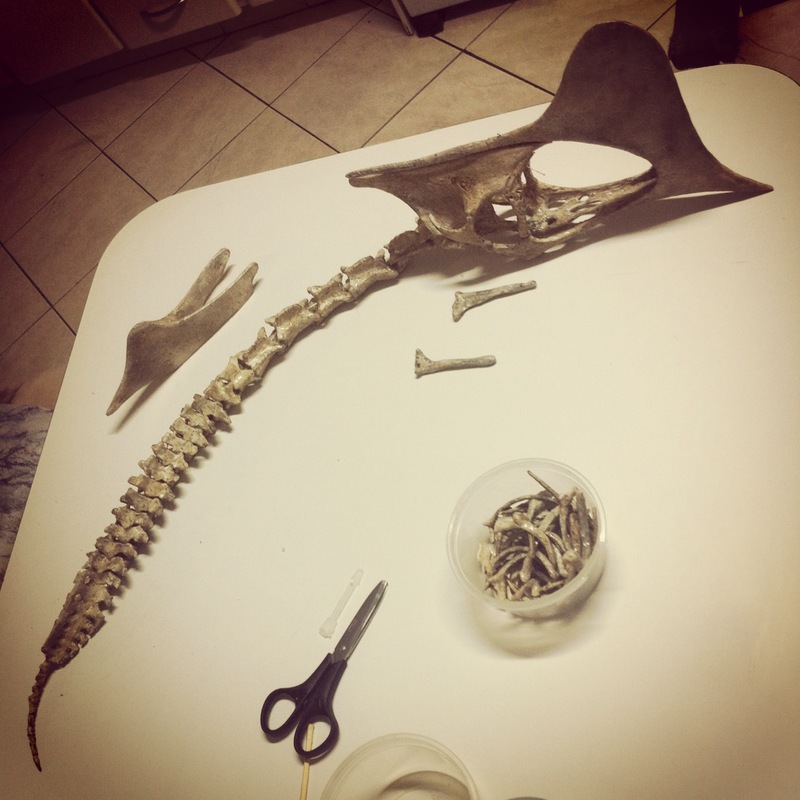 Some bones are still too thick and the ends probably need some adjustments. 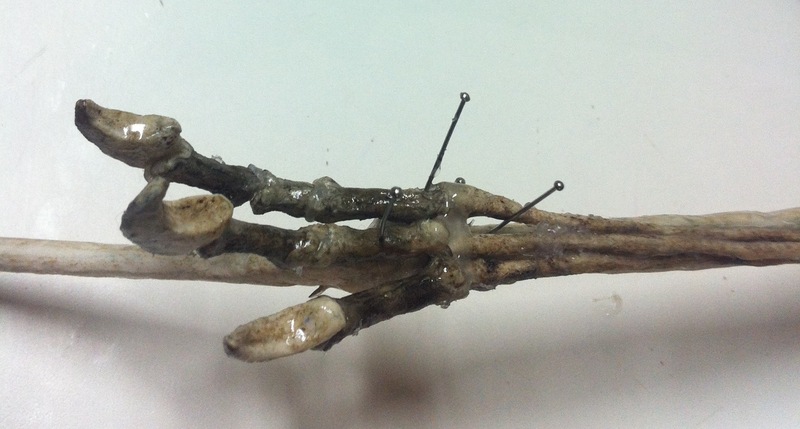 This is a view of the proximal end of the first phalanx (the end that connects to the wing metacarpal). 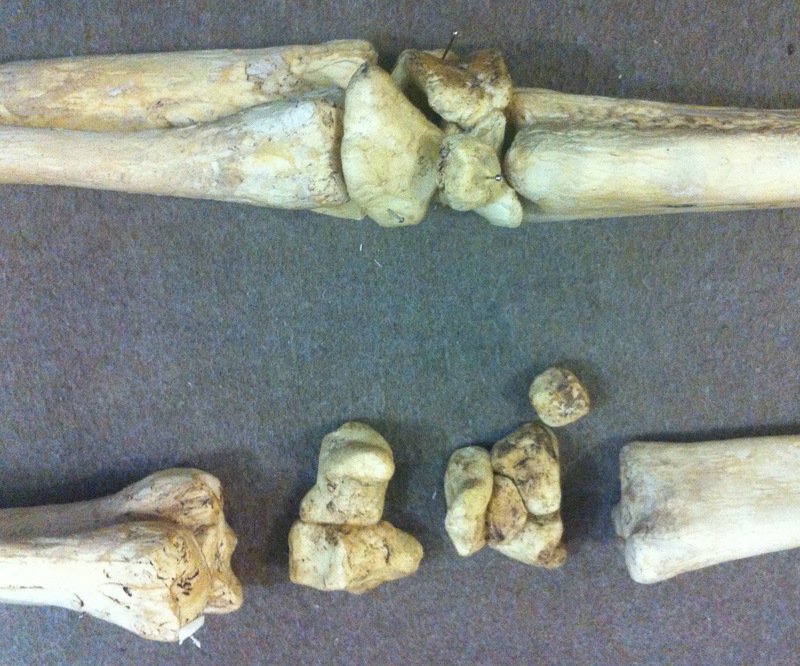 And here are some pictures of the bone ends (proximal ends). Now I can assemble the wings. I still need to finish the metacarpals, carpals, radio-ulna and humerus to connect this to the body. Here they are compared to a small keyboard (the keyboard is 35 cm long). 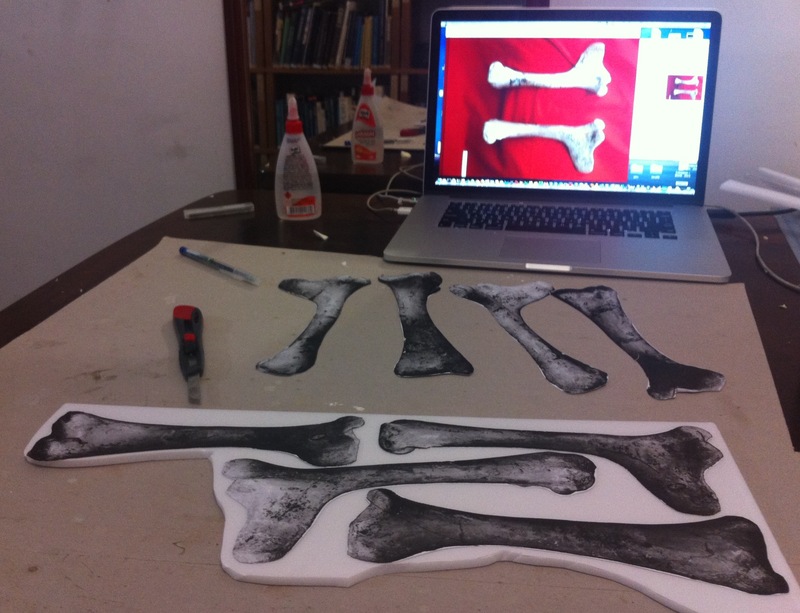 I started the humerus and the ulna-radio pair for each wing (click to see a larger image). I made them hollow, using different techniques. 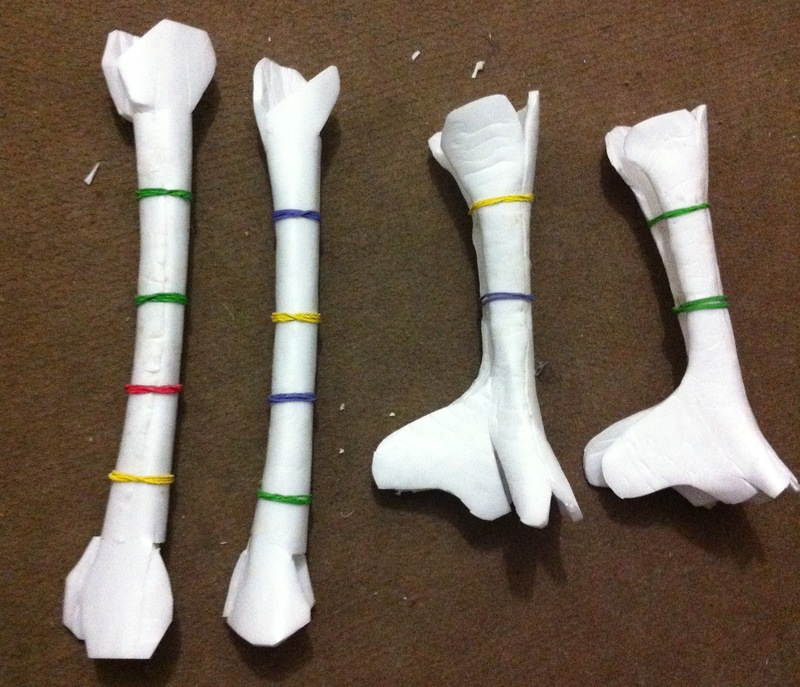 I printed the four views of the humerus and used them as guides to cut out four parts. I should have cut them some 20% thinner along the middle (diaphysis), since it has a cylindrical shape. But I did not, so I couldn’t use all four strips of foam. 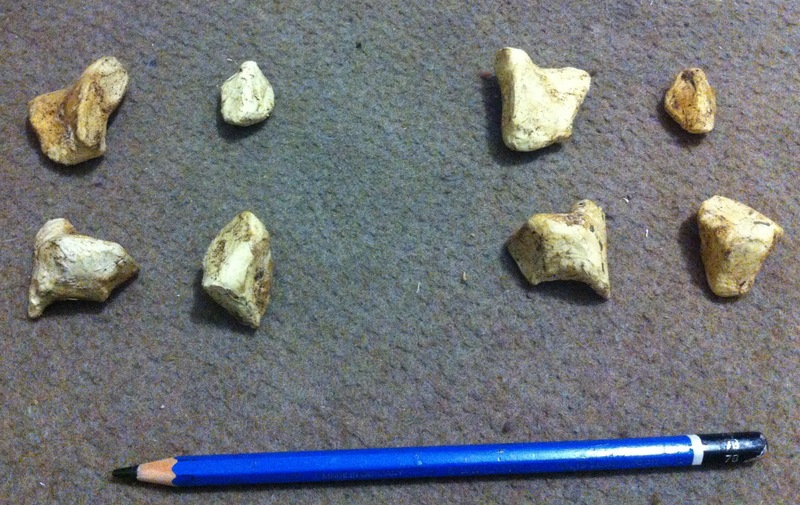 The humerus has a prominent crest on one side so I chose the two pieces which contained it and attached their edges to the piece cut from the “rear” view. 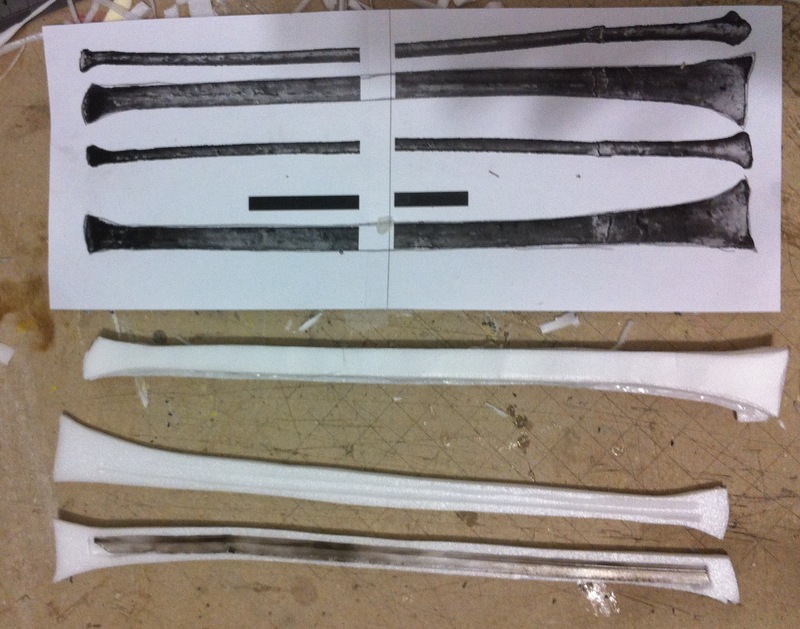 I also cut some round strips of foam to use as a guide when shaping the bone. I glued the three sides together and let them dry. Then I squished, folded, pressed the foam to shape. 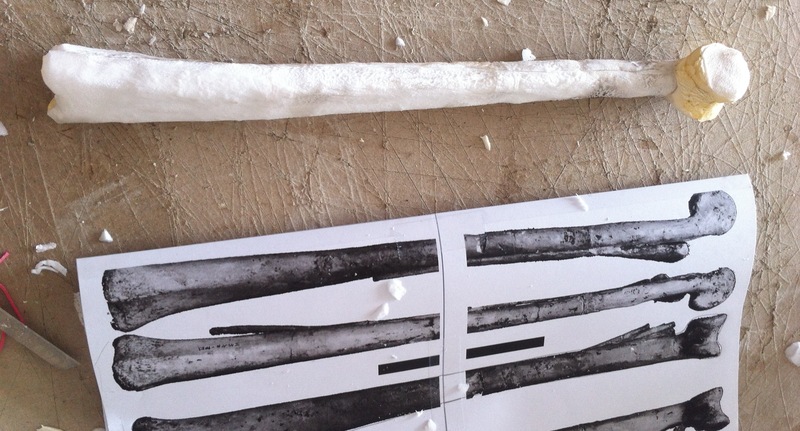 It takes some time to dry, and if you start squishing and cutting, the parts may detach. They did! 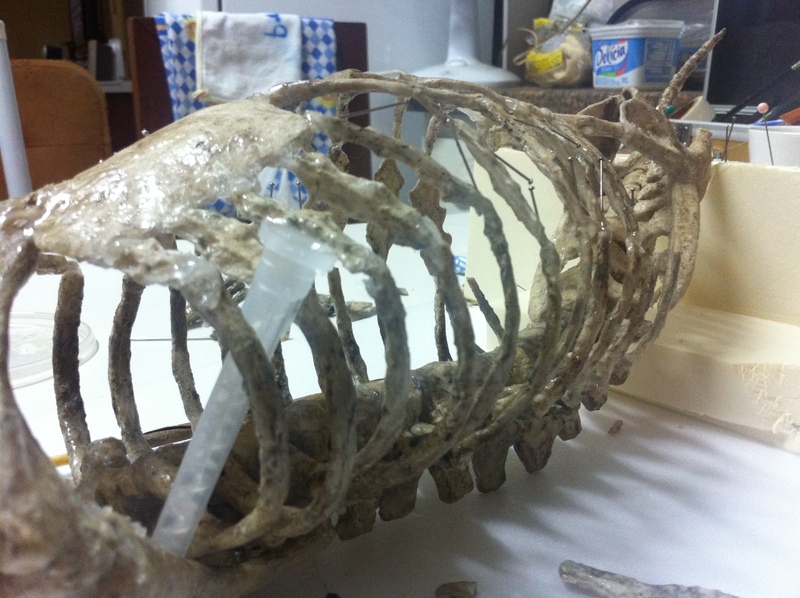 I used rubber bands to keep everything in place and let it dry and started working on the ulna. Since the bone ends (epyphisis) have an irregular format, I added a thick piece of foam there so I can carve the details out later. I still didn’t add one of those to the other side, near the crest, since I don’t have yet a clear picture of what it should look like. 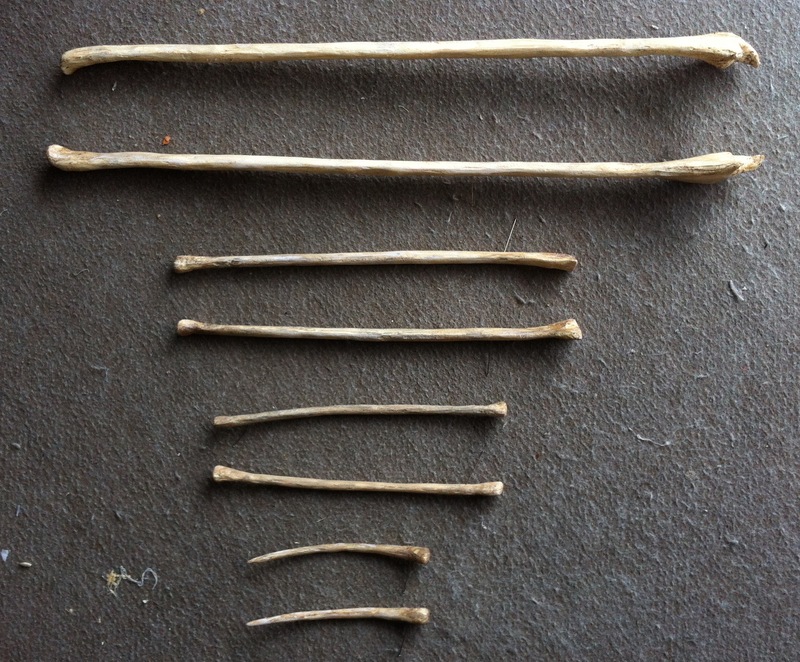 While the humeri were drying I came up with another idea for the hollow long bones. Why not just roll them? There are some difficulties. 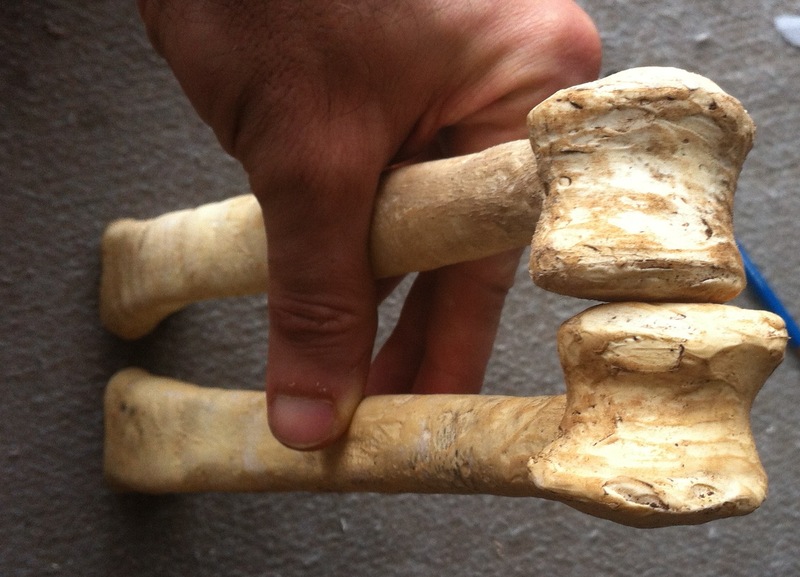 The long cylindrical part of the bone (diaphysis) may change shape. 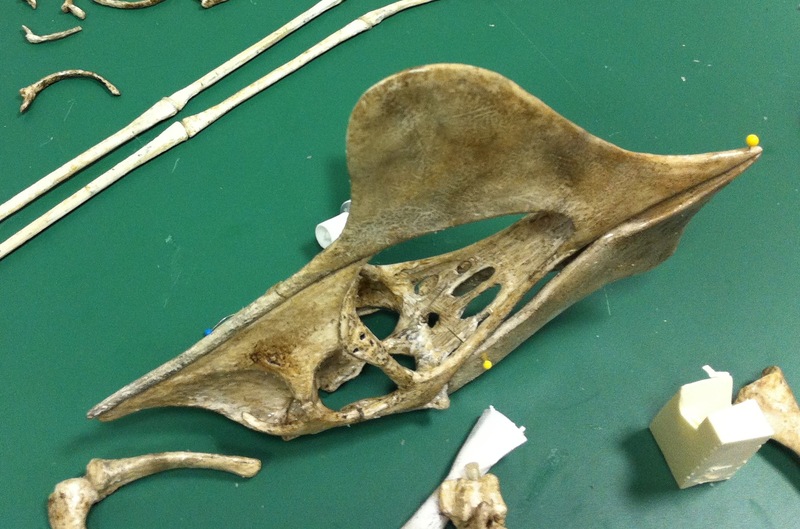 It’s section may be round and wide on one end, and flat and narrow on the other (the wing metacarpal is like that). 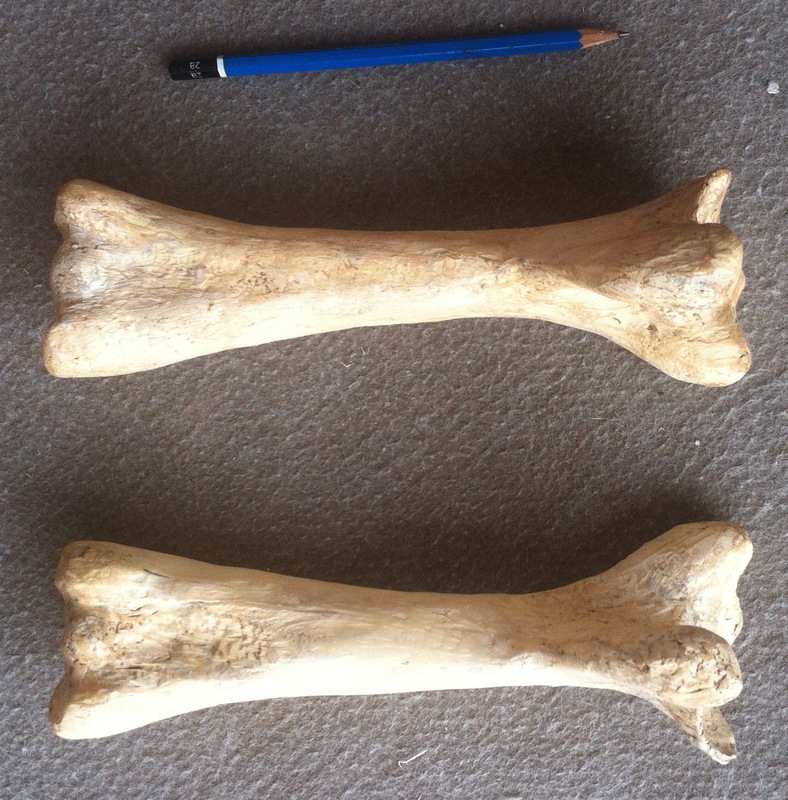 The bone may also be slightly curved. But gradual changes in section width and shape, and bending can be done very easily while gluing the cylinder. I decided to give it a try. 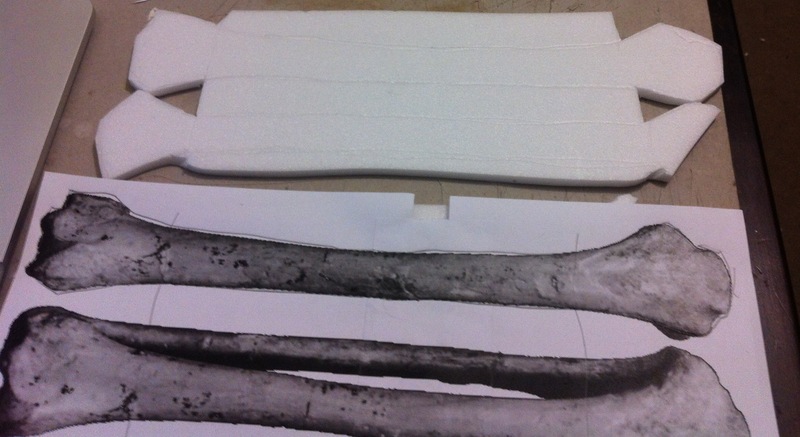 I cut out the whole bone from one piece of foam. Tried to squish it and curl it, but it cracked in several parts and I had to throw it away. I tried it again. This time I squished the foam well before cutting it out and it worked. I was able to curl it all the way. 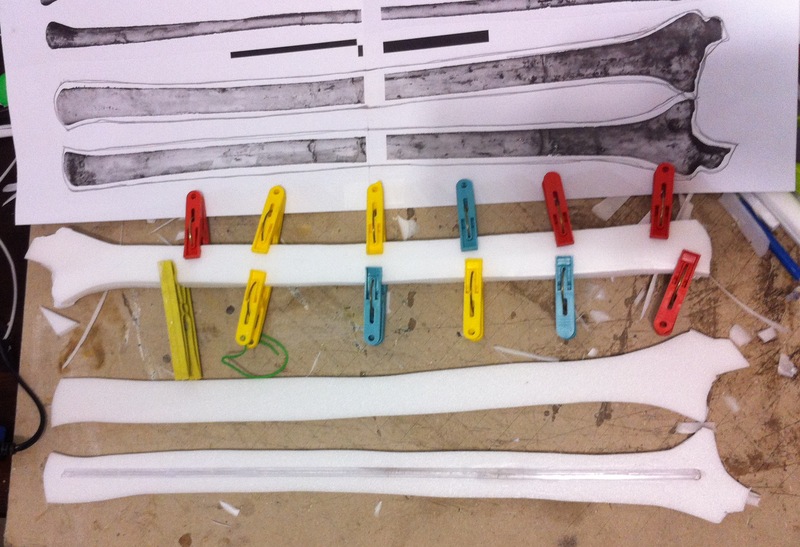 You have to do all the folding before cutting the foam. It is still not that easy and if it cracks you have to start again since cracks will make it very hard to shape the bone later. When both sides were attached with glue and kept in place with rubber bands and tape, I rolled it a bit more near the centre (the glue was still not completely dry), making it narrower. I also gave it a slight bend. The result compared well with the photos. I can still improve it later in necessary and add any details, since the foam is 5mm thick and can be carved. 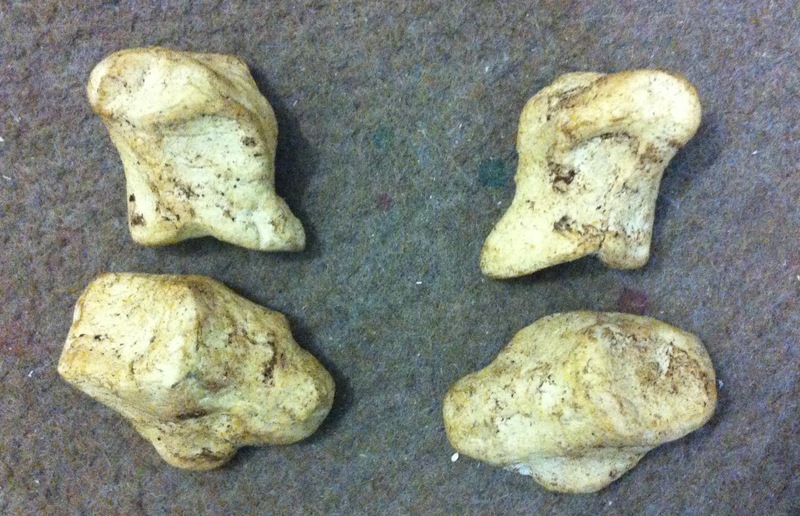 Now I have two humeri and two ulnae drying. Time to make the radii. 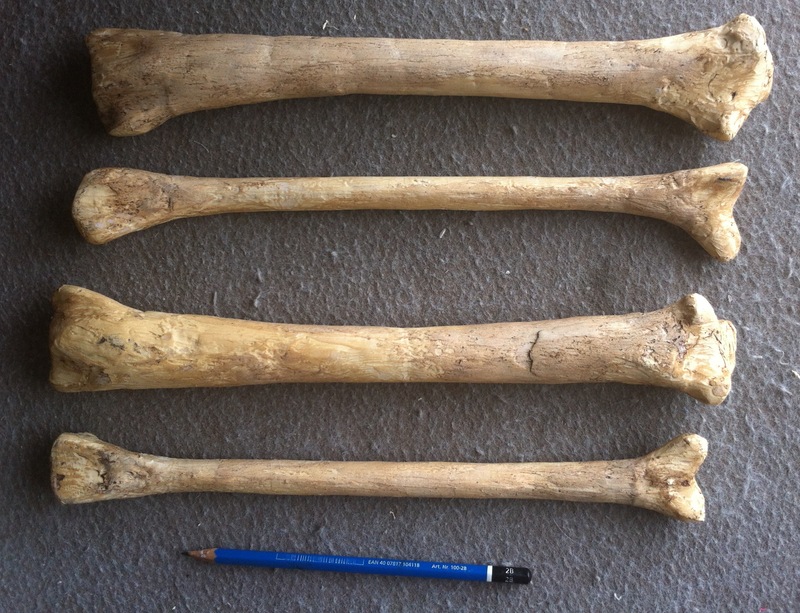 The radius is not much smaller than the ulna. It’s much flatter so I decided to not use the cylindrical technique to make it. I made a box like the picture below. Later I will shape it by carving the edges. 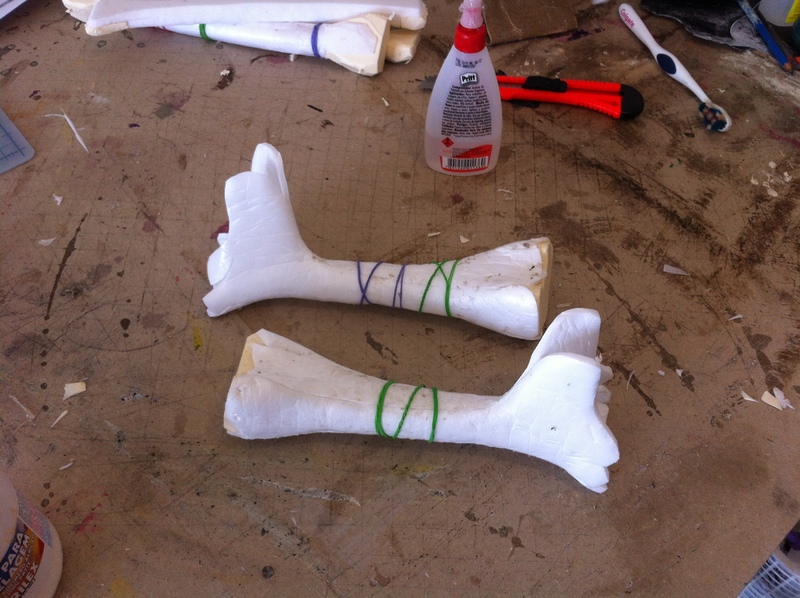 I used thick foam for the bone edges so they can be carved into shape later. 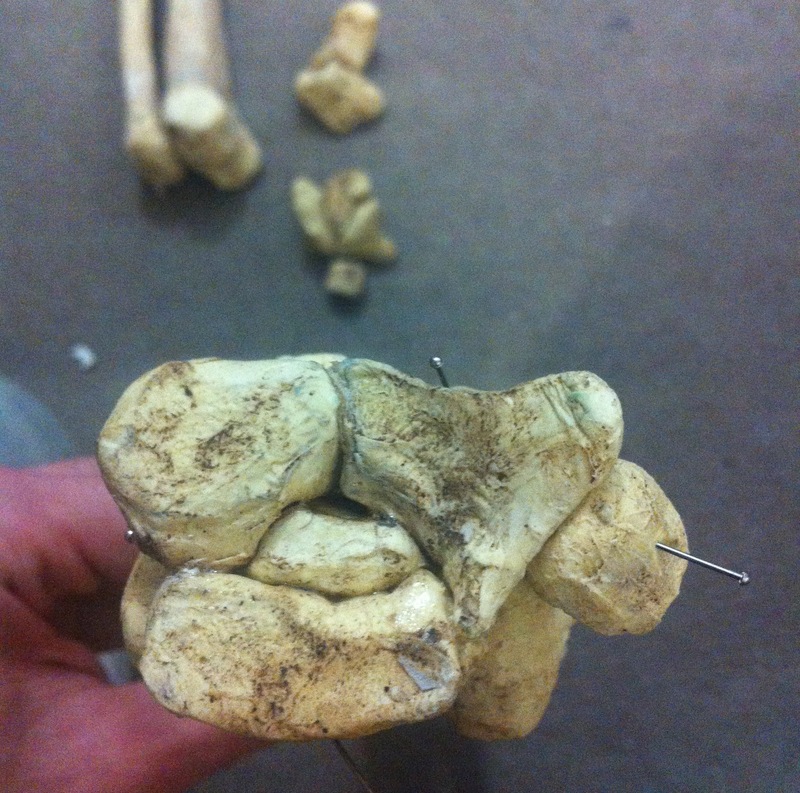 I also added the bone ends to the ulnae. 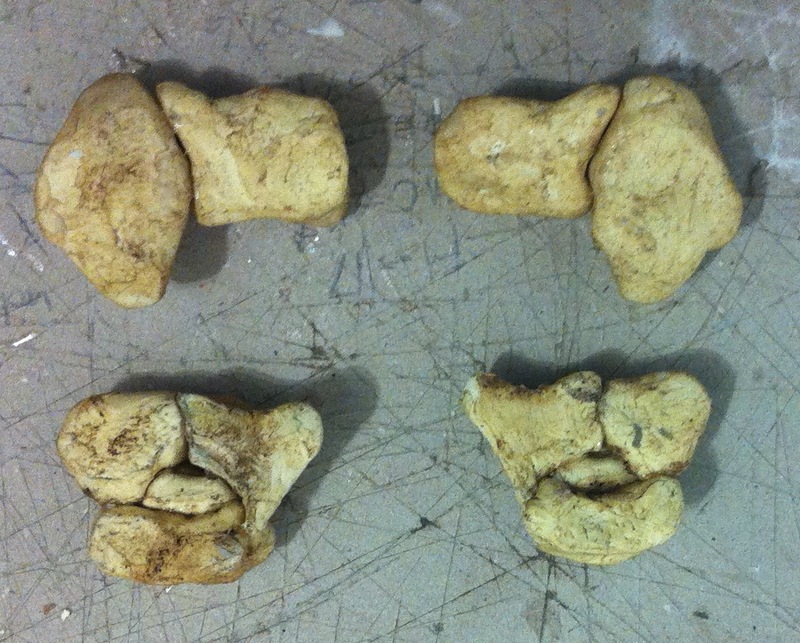 So here is the result so far: two humeri, two ulnae and two radii. I still don’t know how to make the other bones. I will try other techniques and maybe I will come up with an optimal one. 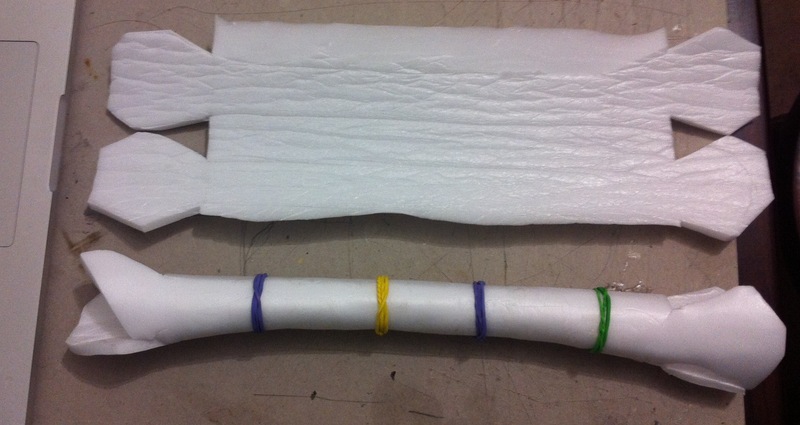 It would be great if I could buy foam cylinders in different diameters, or if there was some kind of foam tape :). Tupuxuara’s wingspan is about 4.5 metres wide. 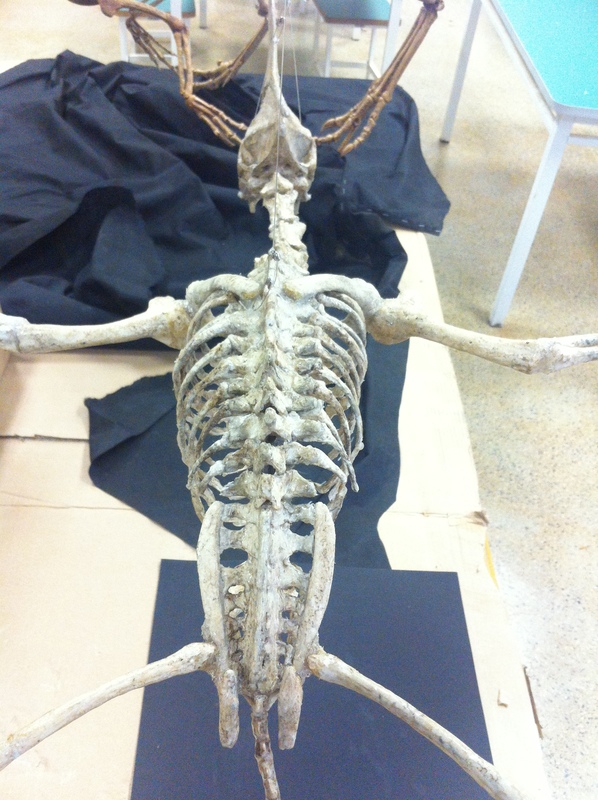 The wing connects to the scapulocoracoid through the humerus, which is the arm bone. 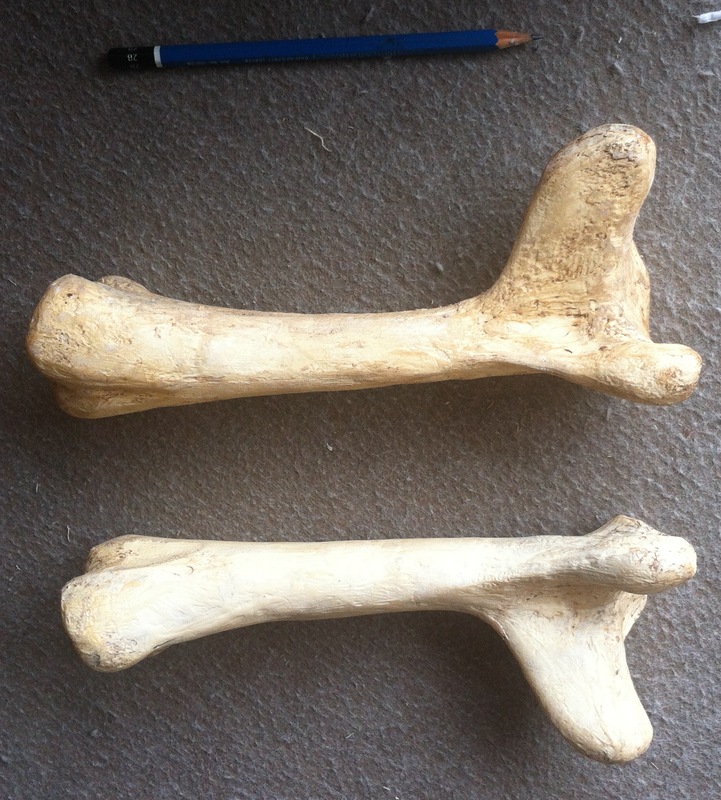 Then come the radio-ulna pair (forearm), carpal bones (wrist), metacarpals (hand) and fingers. There is one large finger which is the wing. 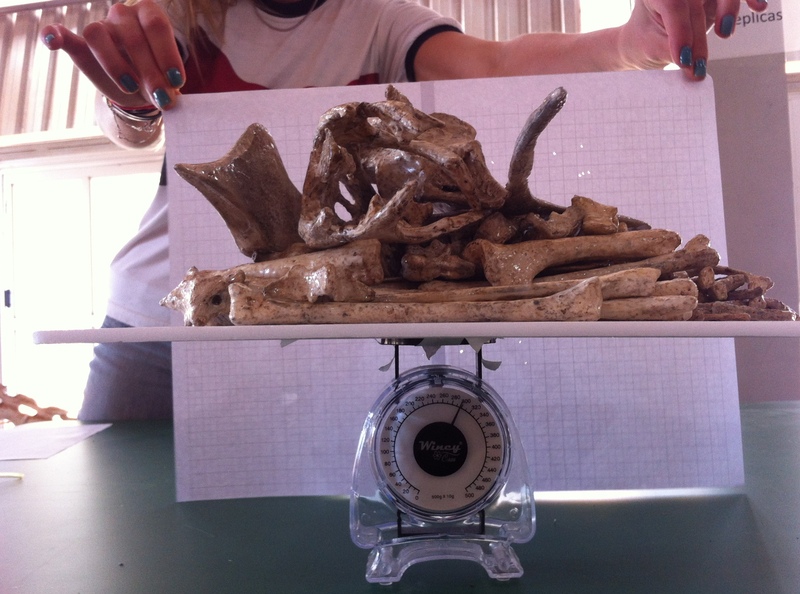 It’s metacarpal and phalanges are more than two thirds of the length of the wing. This is a diagram of the right wing showing the sources that I have (Iwaki museum) in brown. The parts that are missing are shown in white. I will have to invent them. Click to see a larger image. 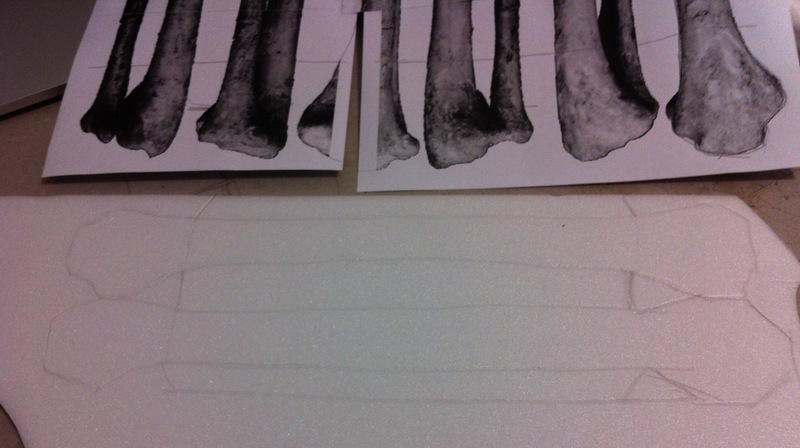 Most of my sources are four photographs of each bone, showing four sides. 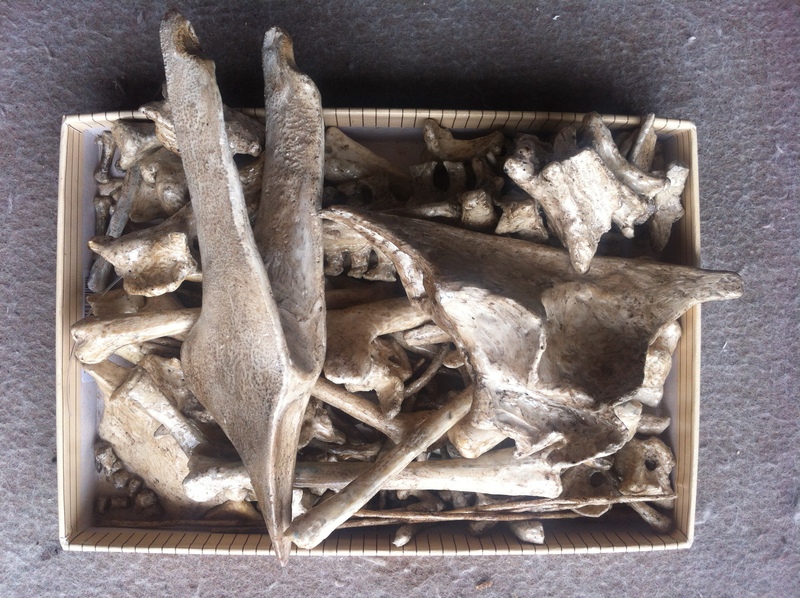 I have no photos of the bones viewed from the tips. I will have to do my best to discover their shape from the pictures I have. I will certainly miss details (concavities, for example) unless I can infer them from shadows. 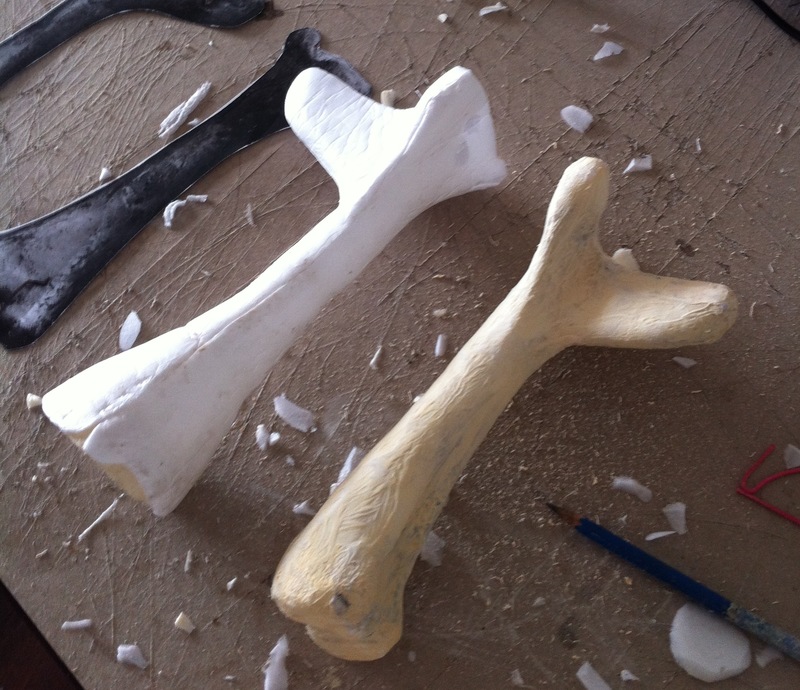 I will start with the humerus but will make all the bones at the same time (it’s faster that way and I can let the glue dry better before carving and shaping).